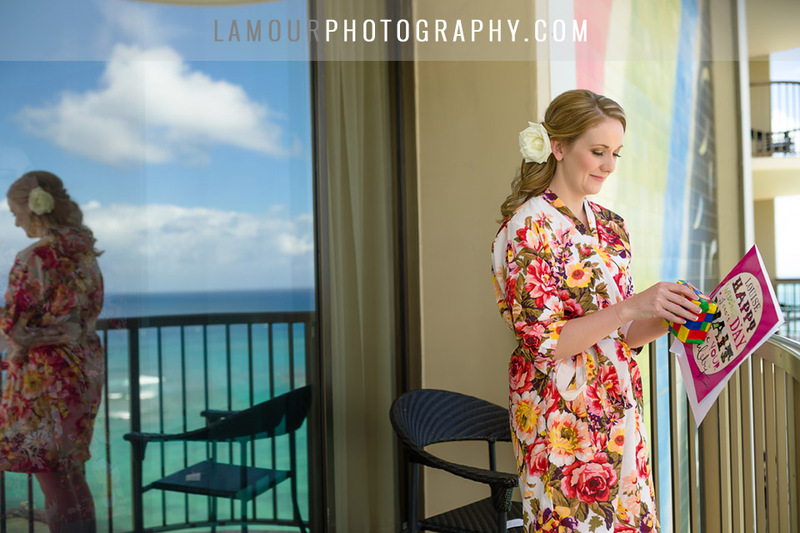 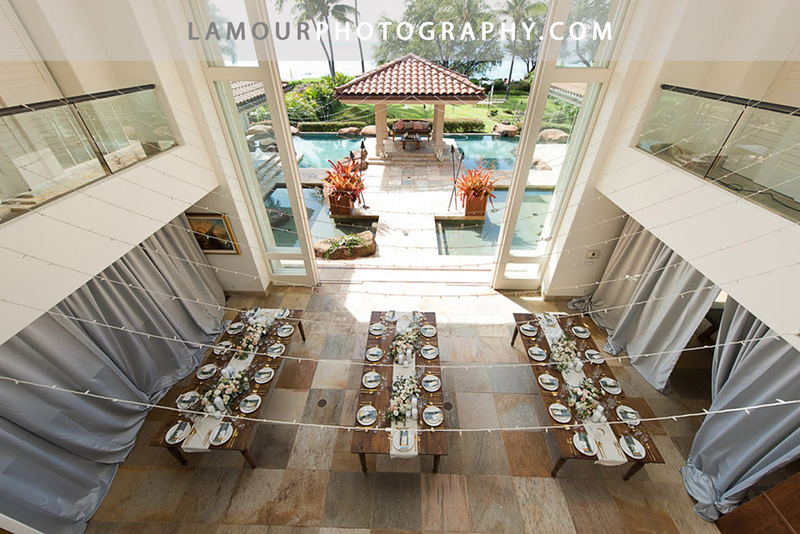 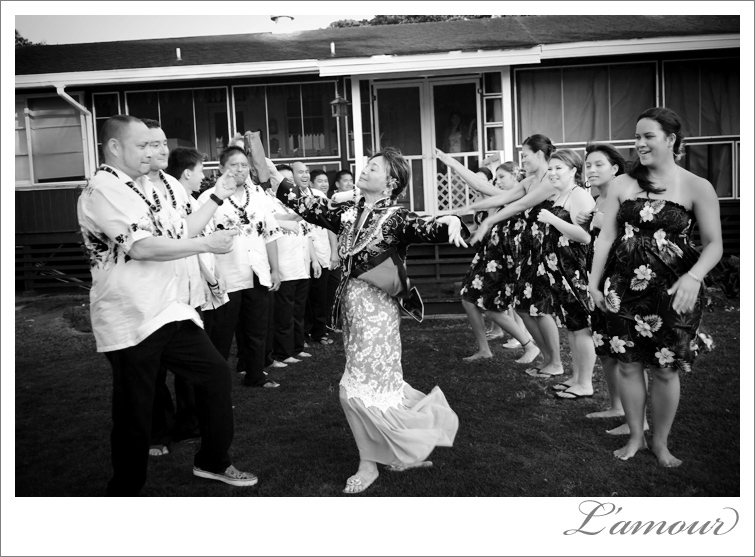 This mother-of-the-bride was such a fun part of this large wedding party at this private estate wedding on the North Shore of Oahu. 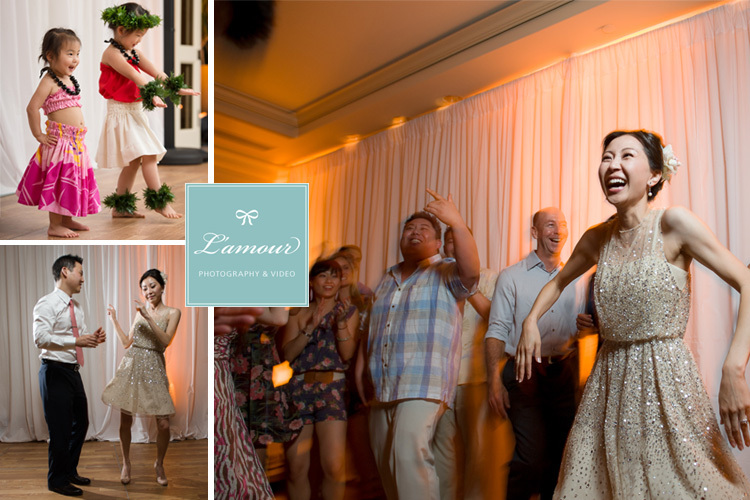 As the wedding party was being introduced at he start of this destination wedding reception, the mother of the bride got the party started by turning on her dancing skills and boogieing her way through the bridesmaids and groomsmen and out to the reception. 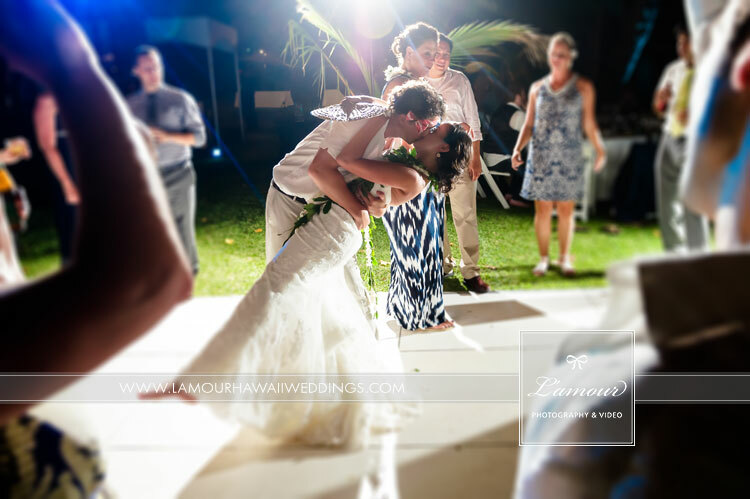 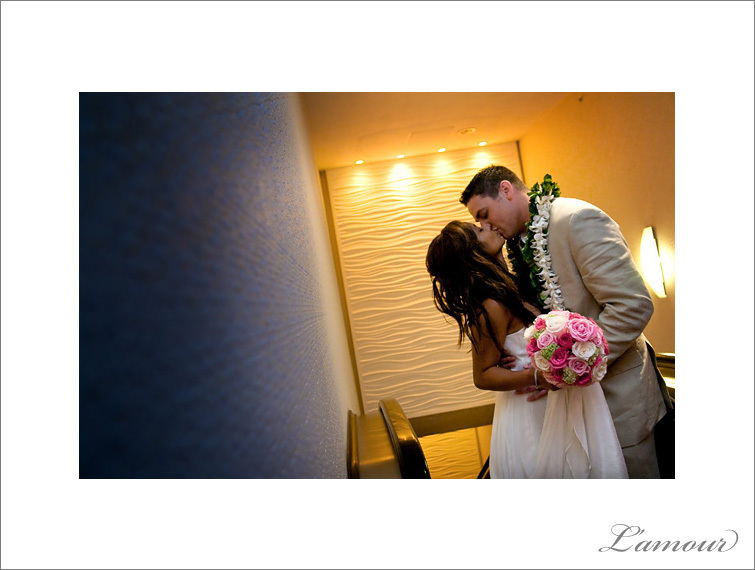 First dances are one of the most memorable parts of a Hawaii wedding. 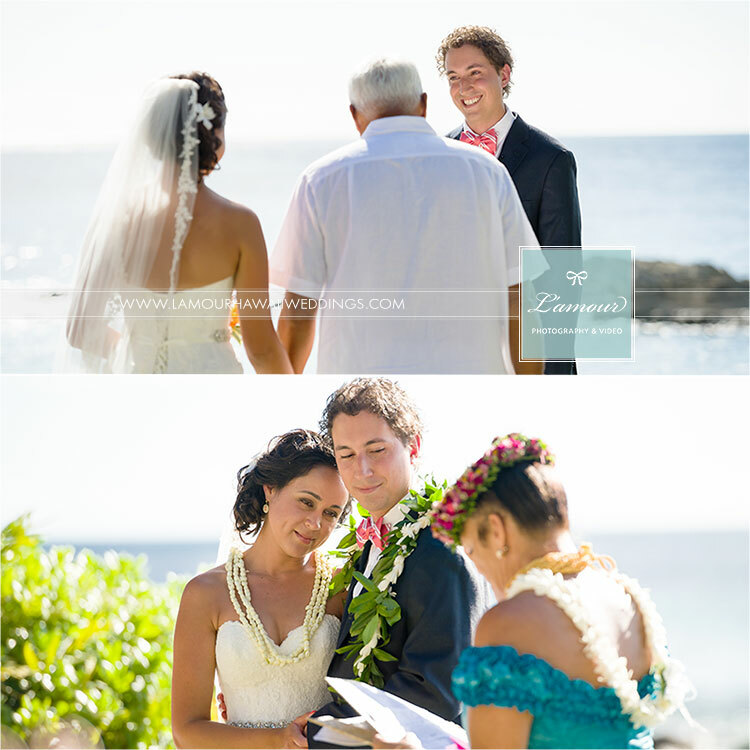 This is the moment the day stops rushing by when the bride and groom get a moment to themselves to look into each others’ eyes with the new excitement of being married. 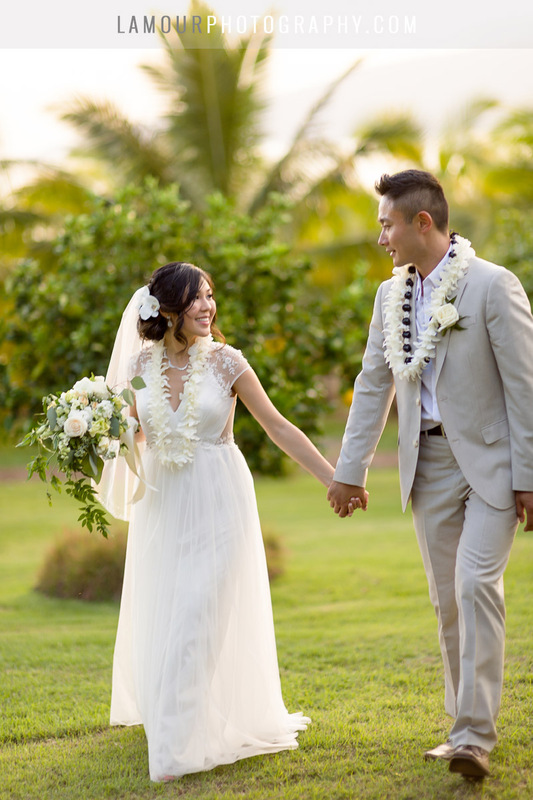 Here are a few hints to help your first dance as husband and wife go off without a hitch. 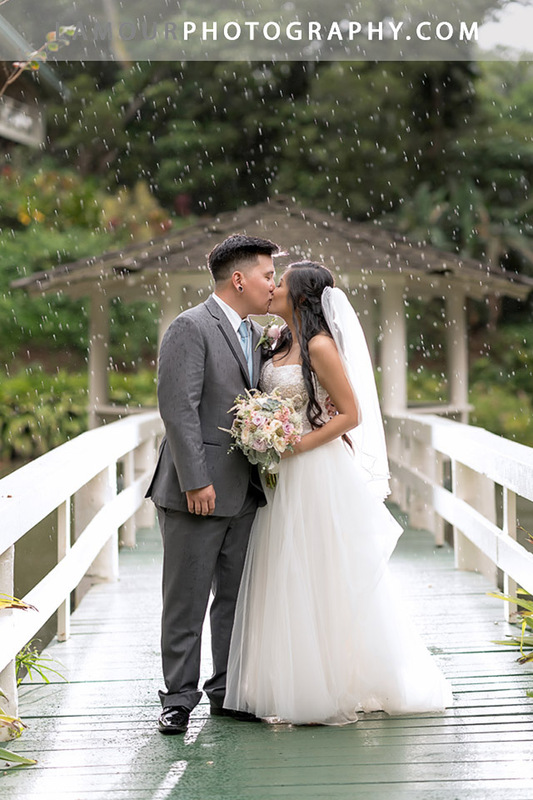 Pick your first dance song: Many couples don’t have a special song, so here are some suggestions to help you find the perfect song. 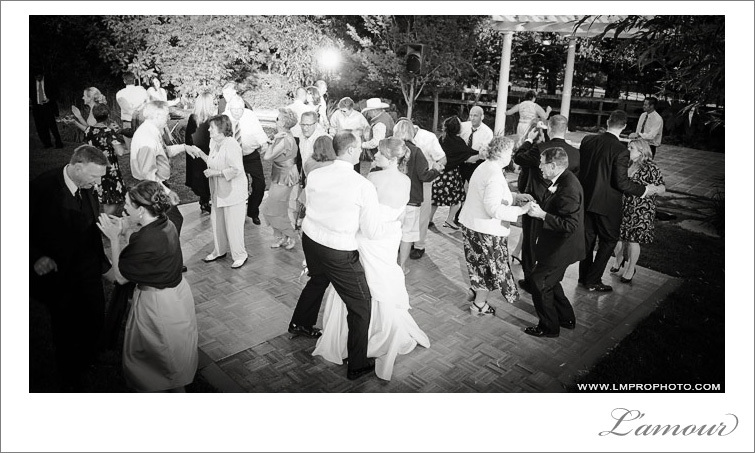 Consider some classic “oldies” love songs that can give your dance a very timeless and classic feel. 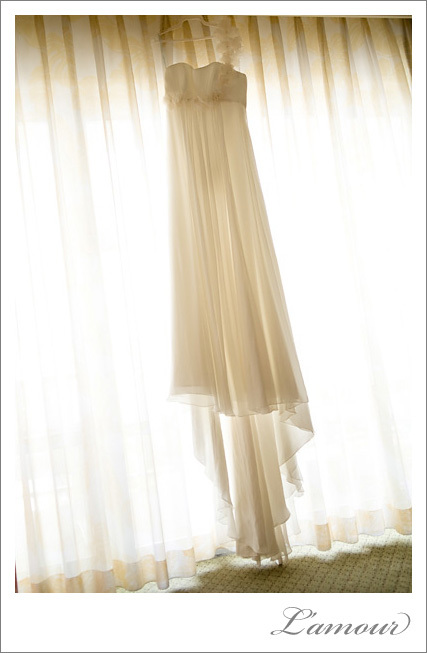 If you share a favorite band, look up the band’s songs and see if there is a good slow song. 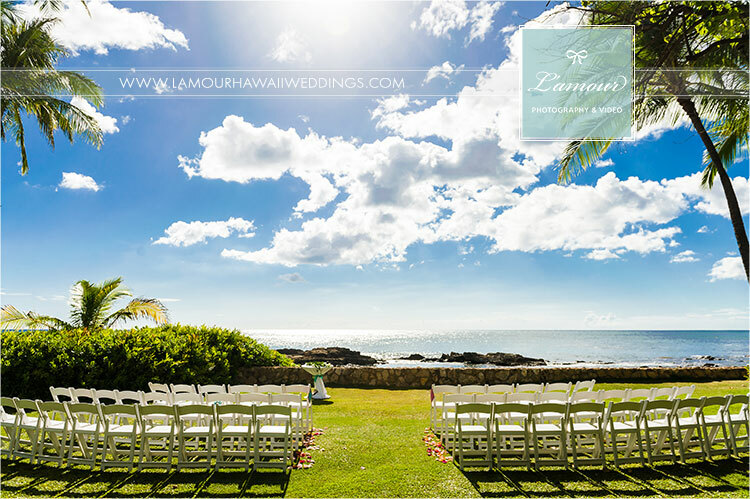 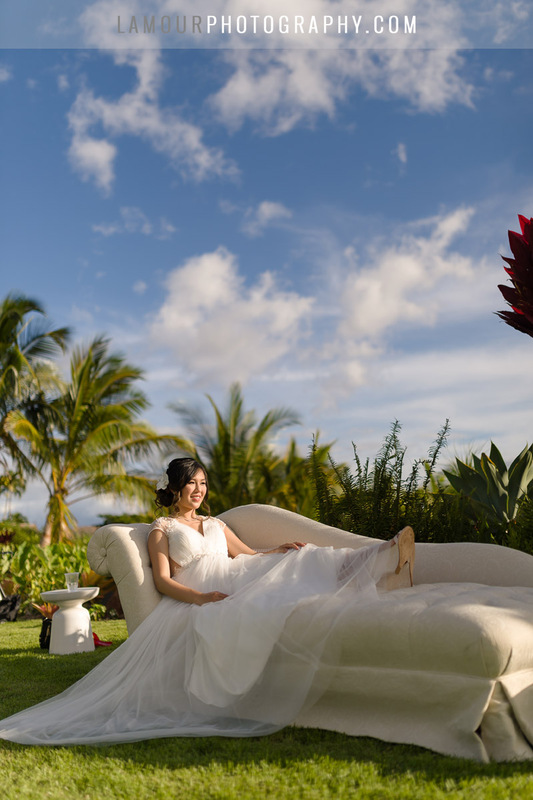 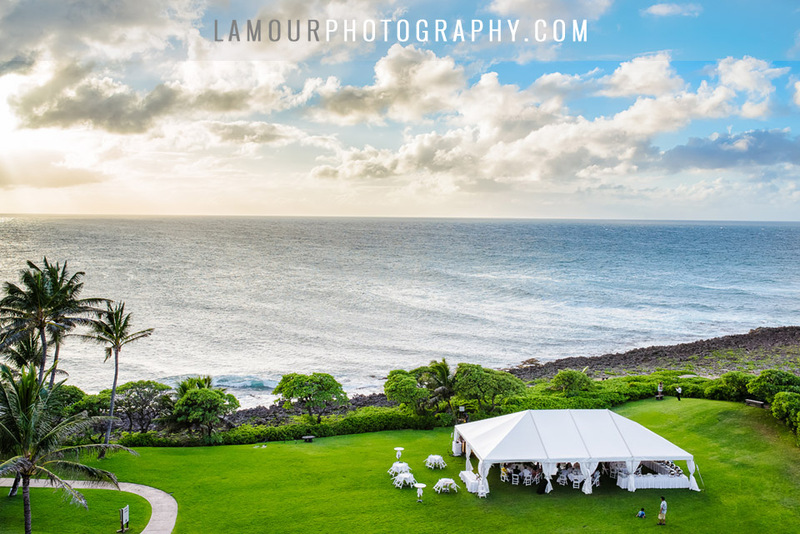 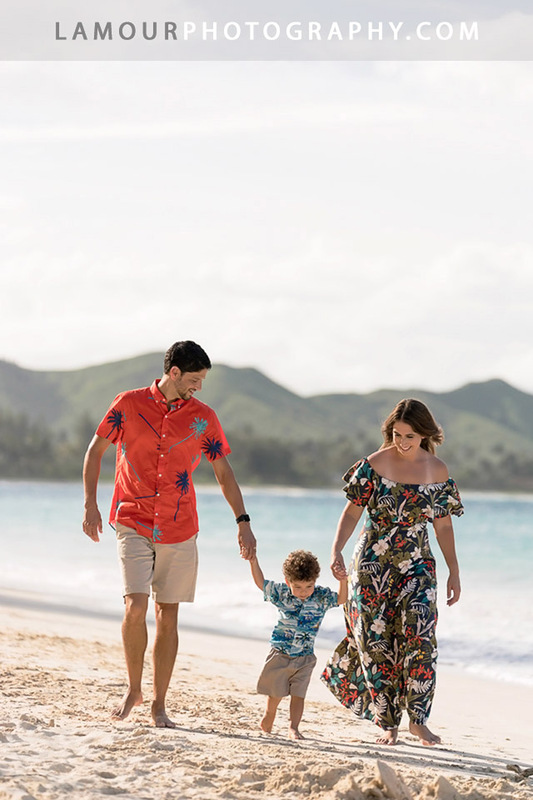 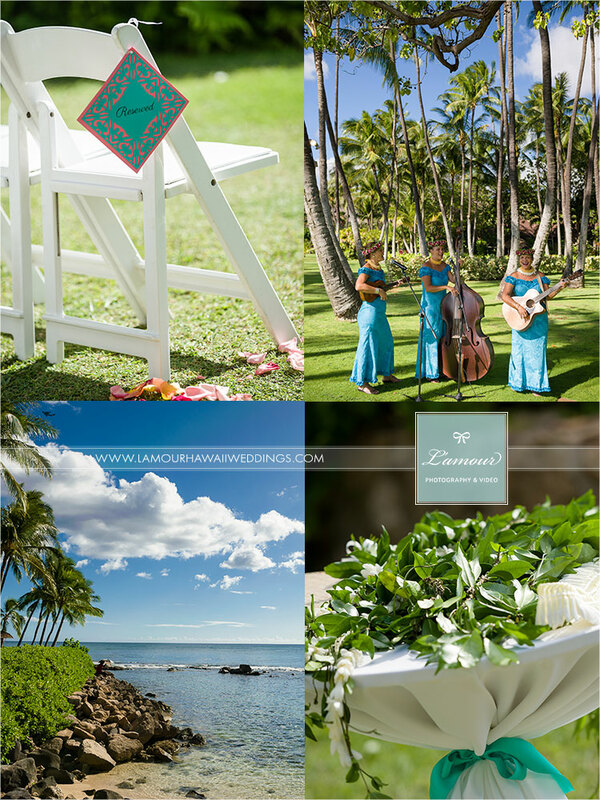 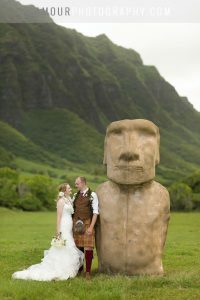 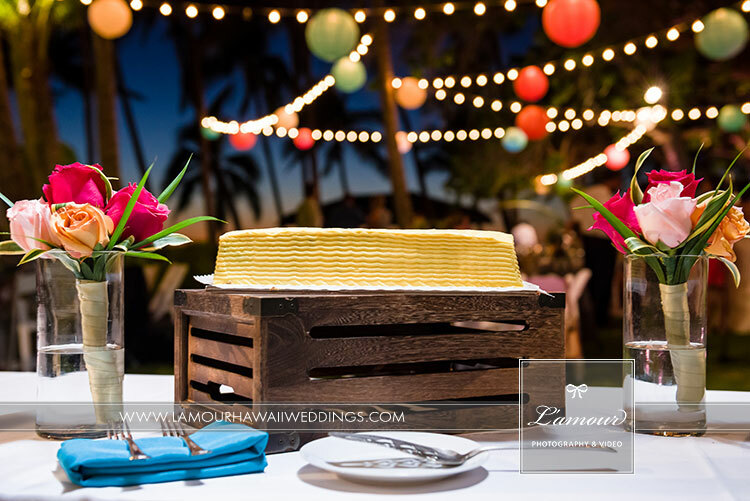 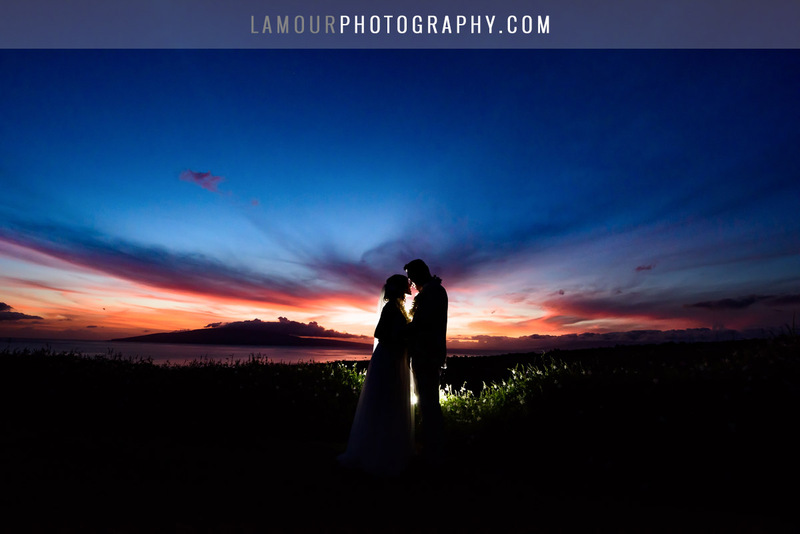 If you are getting married in Hawaii, you might want to look into traditional Hawaiian love songs that can really set the mood for your destination wedding reception. 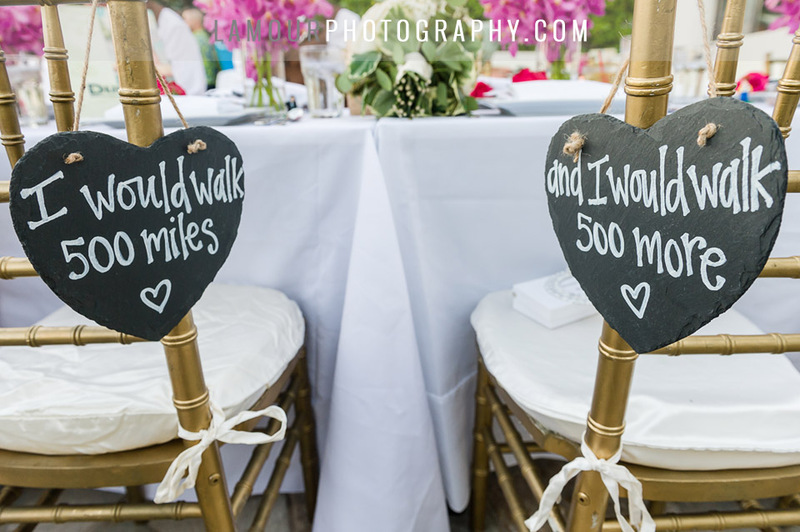 Check the song length: A good length for a first dance at a wedding is anywhere from two to three minutes. 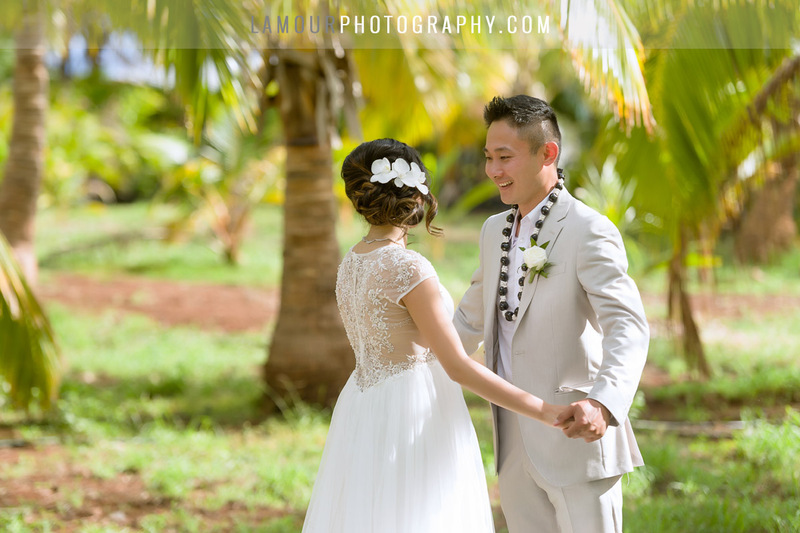 Any shorter than that goes by very quickly and may not give enough time for all the moments you would want in photographs from your first dance. 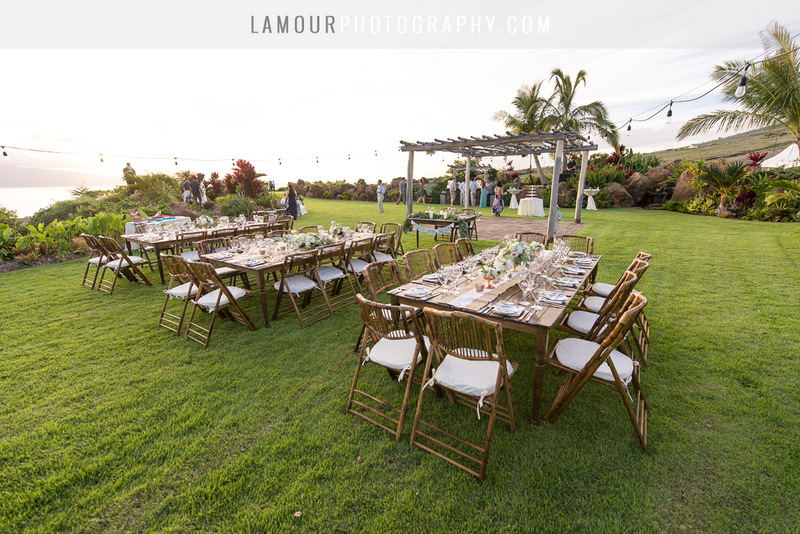 Songs longer than three minutes can lose your guest’s attention and seem like forever to be in the spotlight with everyone watching. 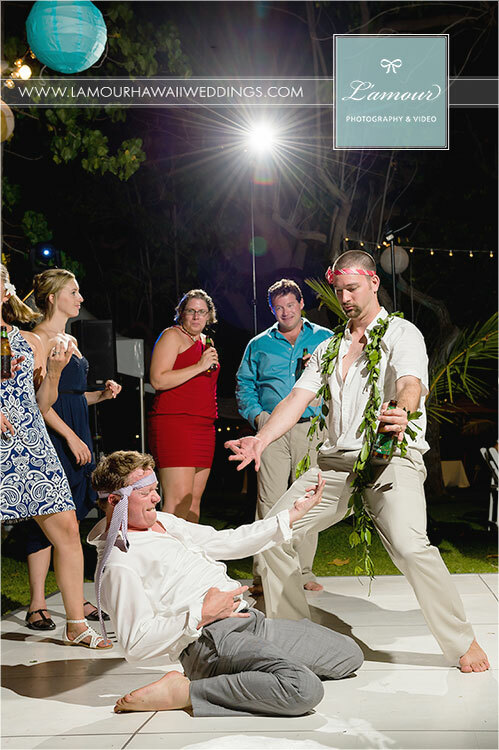 Put a spin on it: Practice dancing with your fiance so you can get the feel for who is leading, where to go, how to turn, or dip. 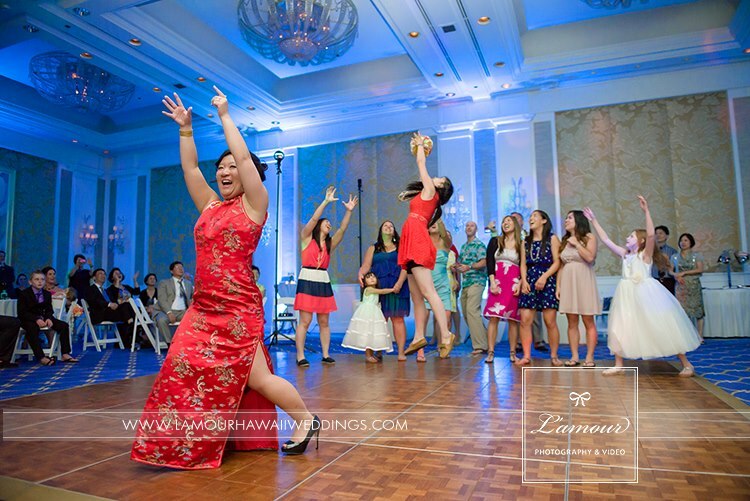 Consider choreographing part of your dance, incorporating your bridesmaids and groomsmen, or using props to add some entertainment value to your first dance. 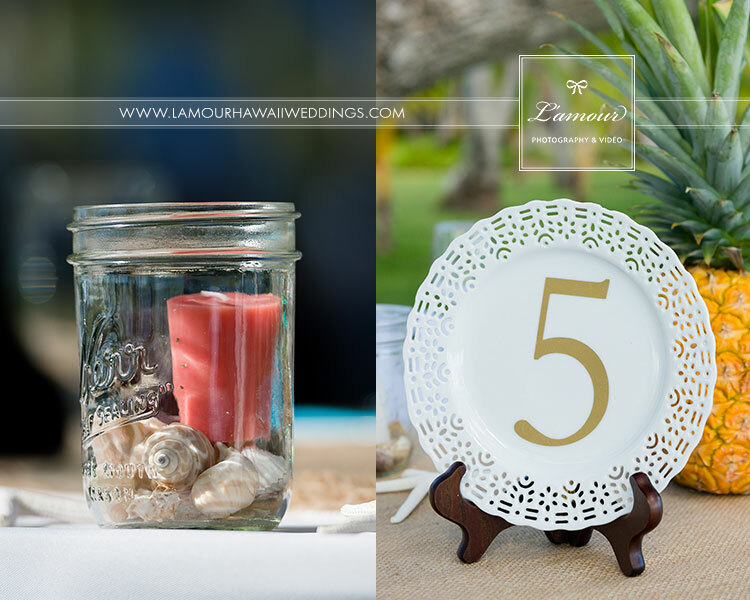 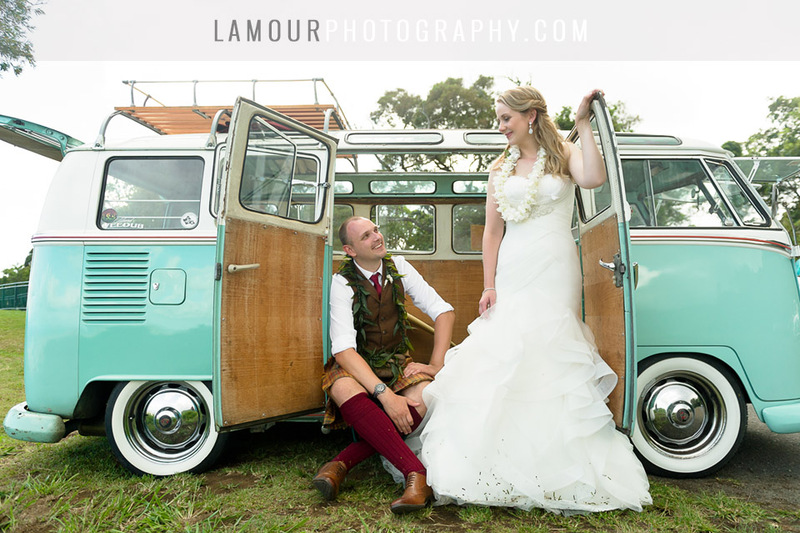 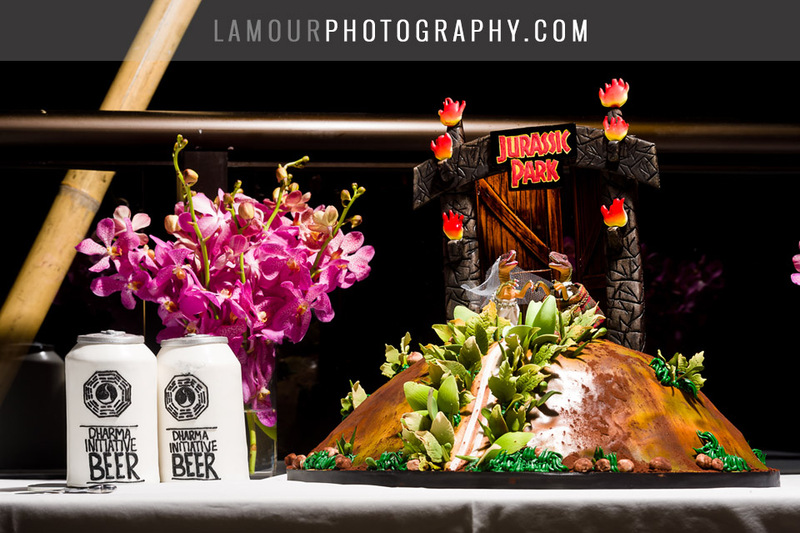 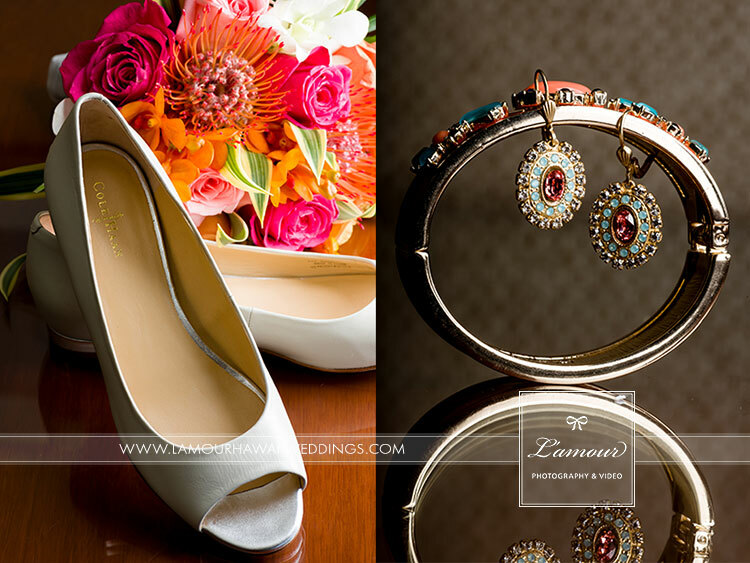 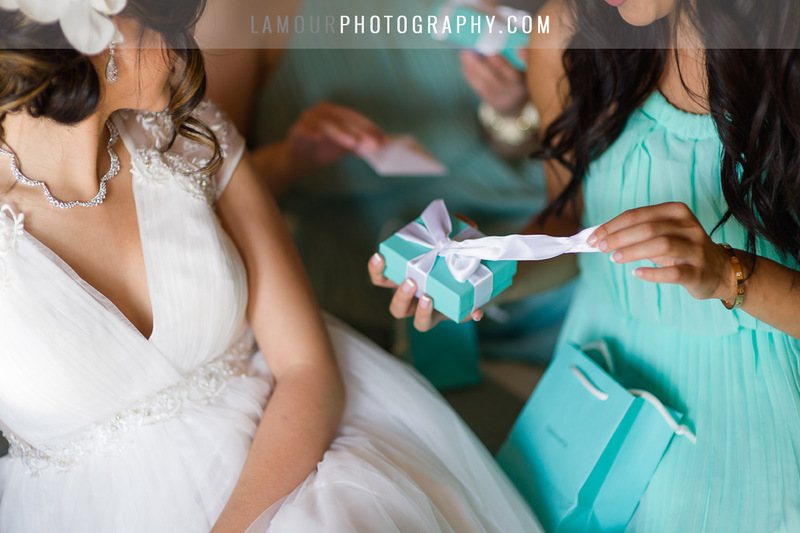 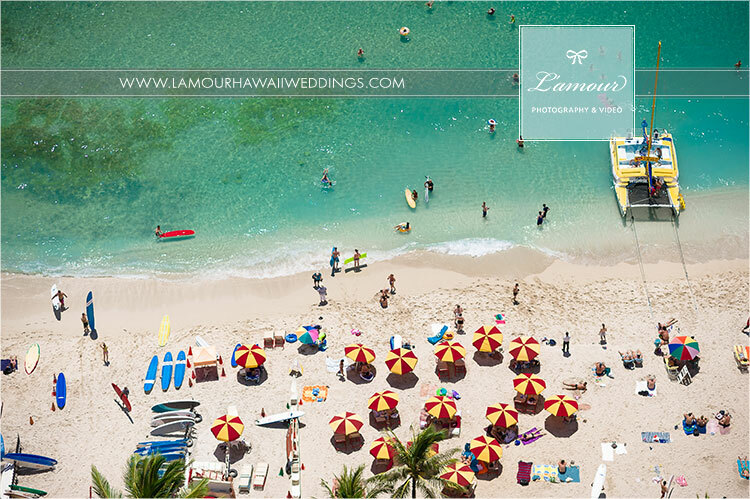 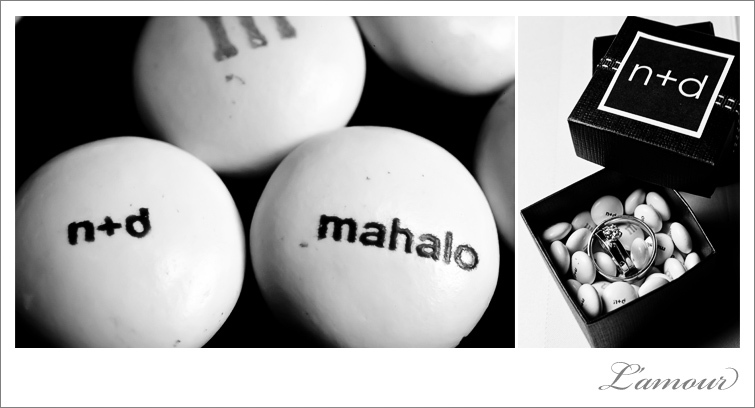 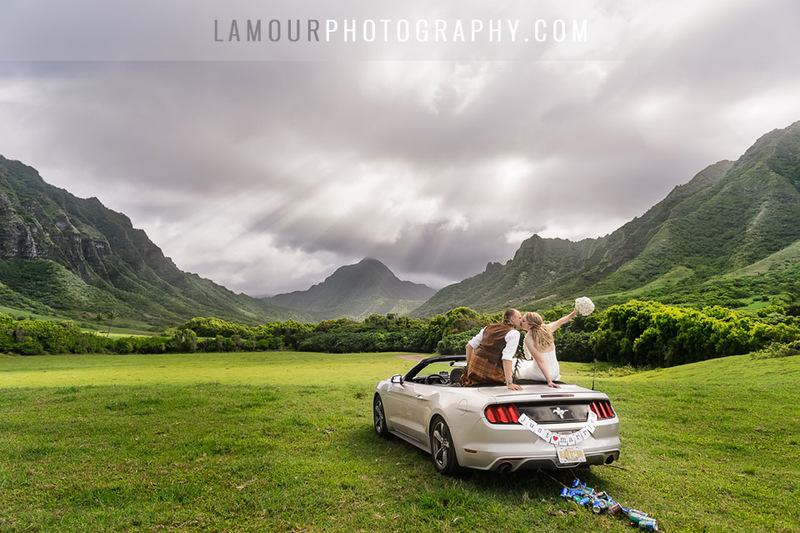 Have fun: That is L’Amour Photography’s moto for every wedding. 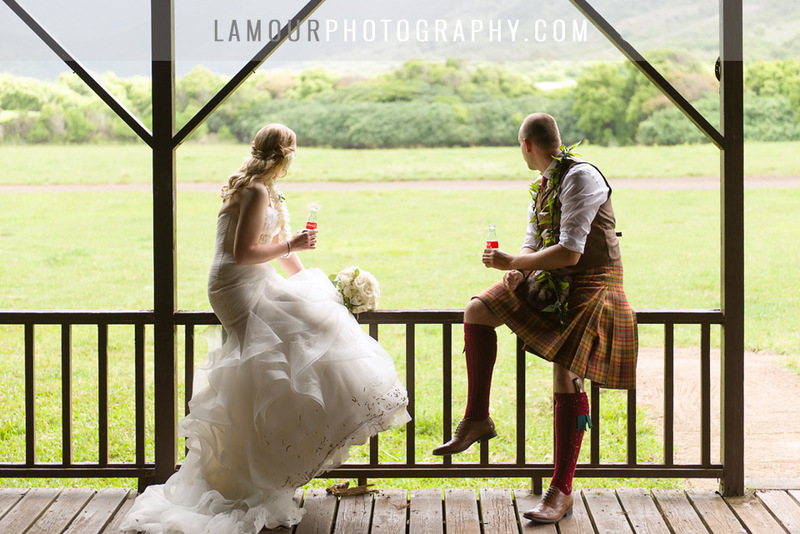 People are always asking us for advice on their wedding. 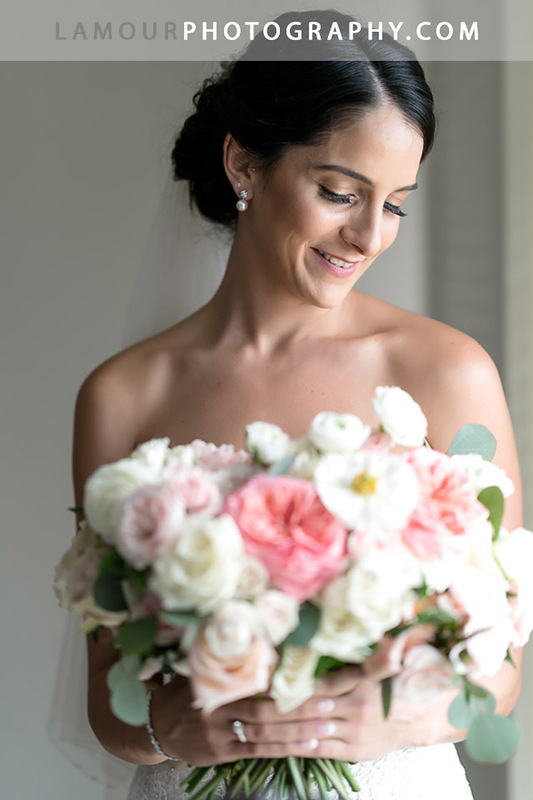 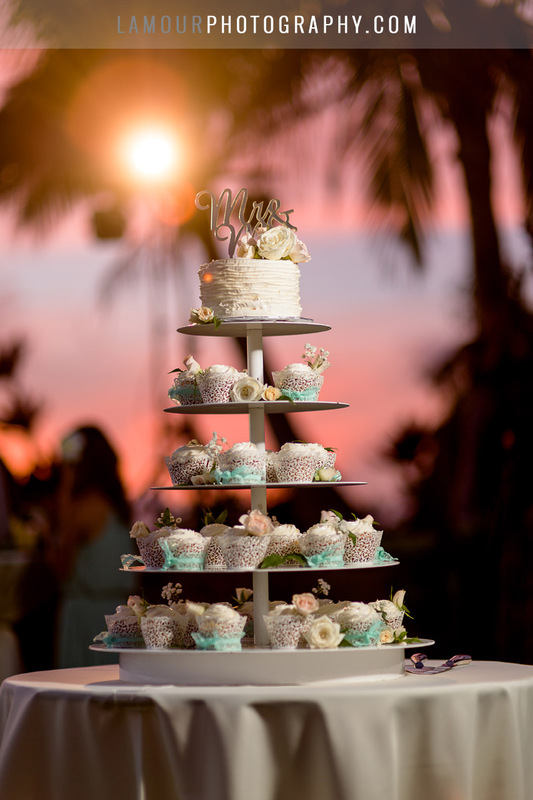 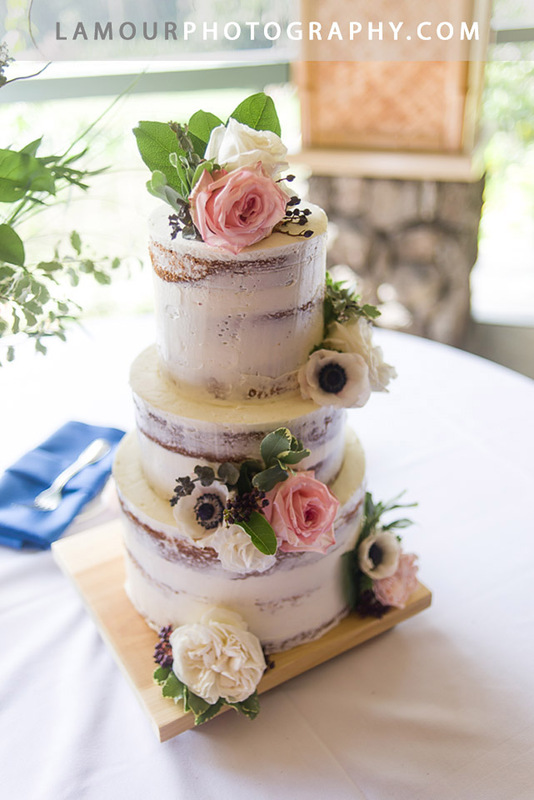 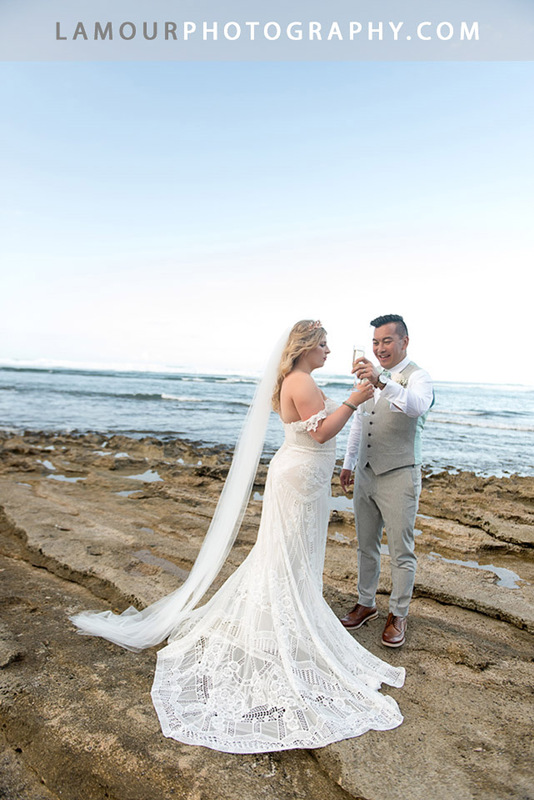 While we always have tips and advice for any bride and groom, above all else, we suggest the bride and groom to make their decisions based on what they really want. 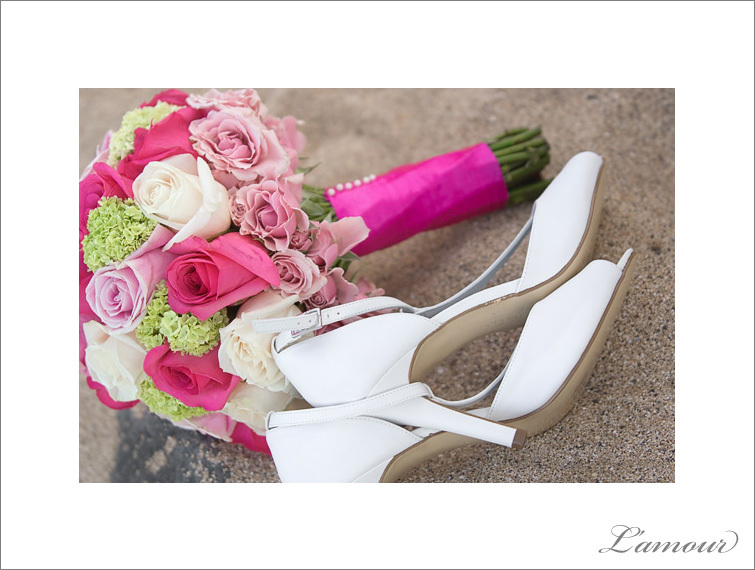 It’s your wedding day, make it your own! 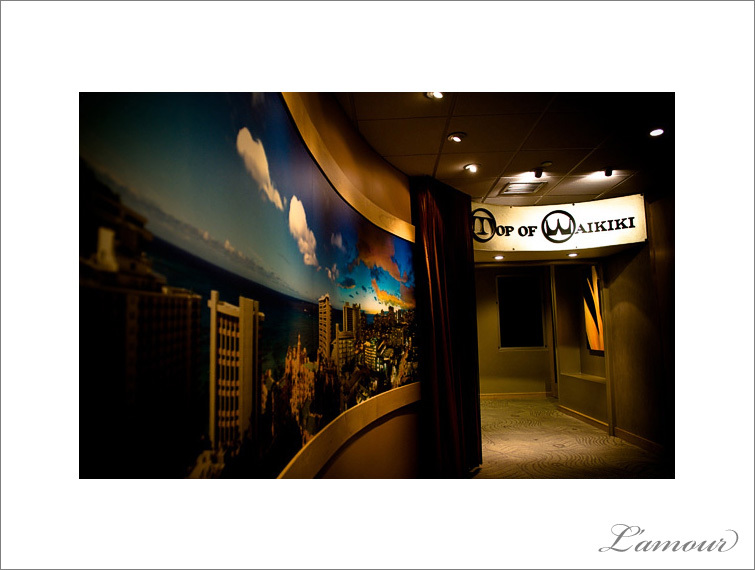 Sometime life takes you to interesting places. 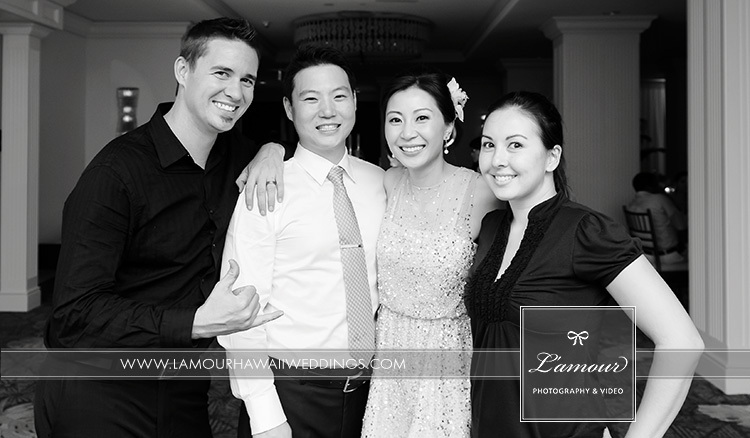 Stacey & Steven flew us 2,500 miles for a wedding 35 miles from where we grew up in California. 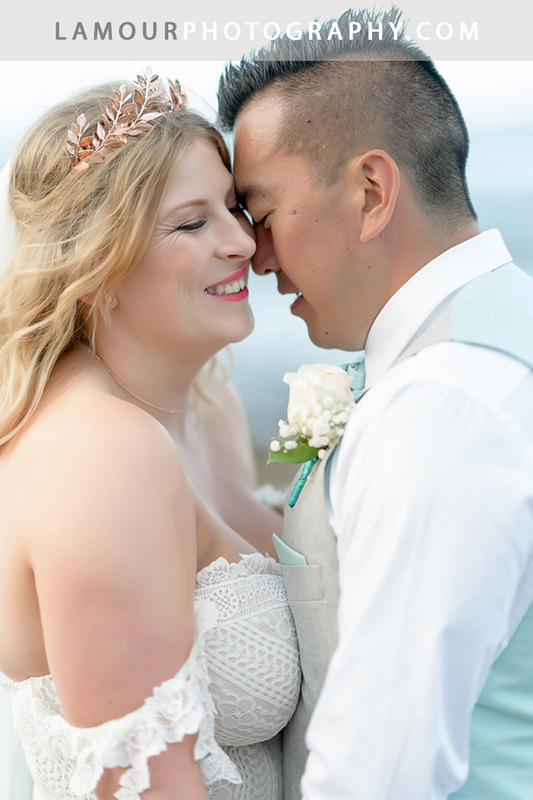 We love to travel for weddings and it was a special treat to be so close to where we grew up, yet a part of the Bay Area that neither of us had been before. 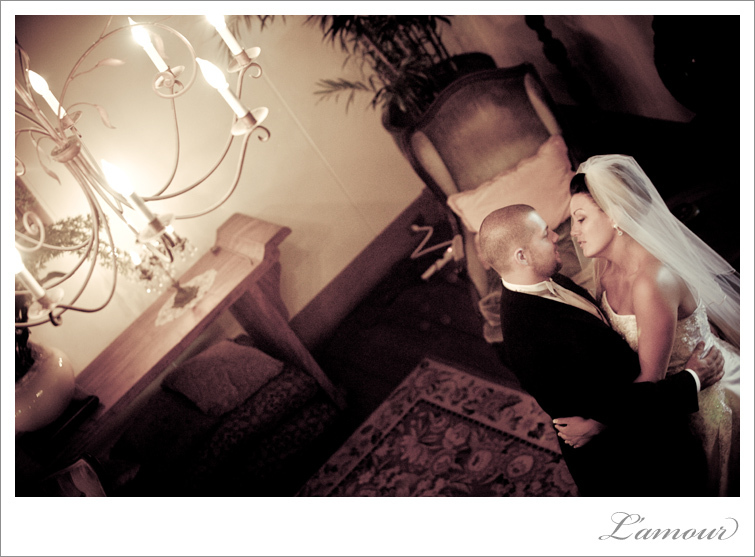 Stacey and Steven’s wedding was held at a private estate in Woodside located in the San Francisco Bay Area of California. 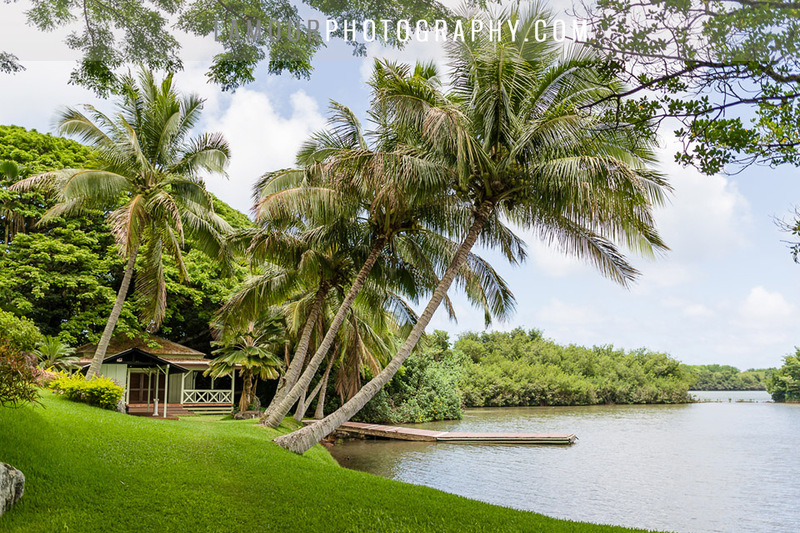 It was the kind of place that makes you ask, “would you mind if I brought a tent and just live in the backyard?” Surprisingly enough, the owner of the estate said there was a two bedroom cottage on the side of the house and that we were welcome to stay there any time. 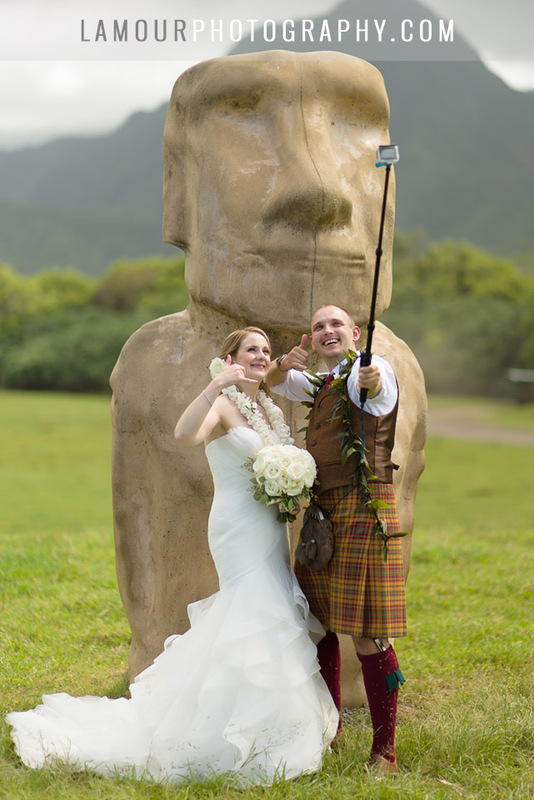 What luck – we forgot our tent. 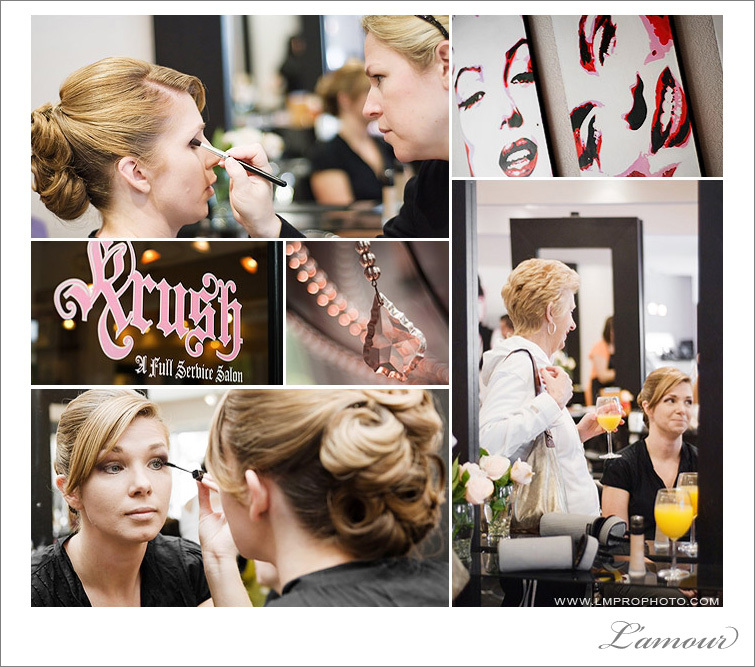 Stacey and the girls started the day the way any wedding day should be started; with some mimosas while getting their hair and makeup done at Krush Salon in Los Gatos. 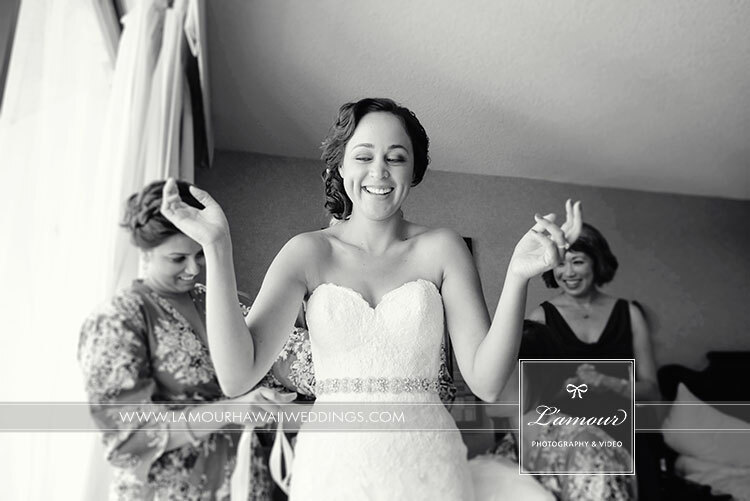 There was such a buzz of excitement as the girls started to realize that the big day was really here. 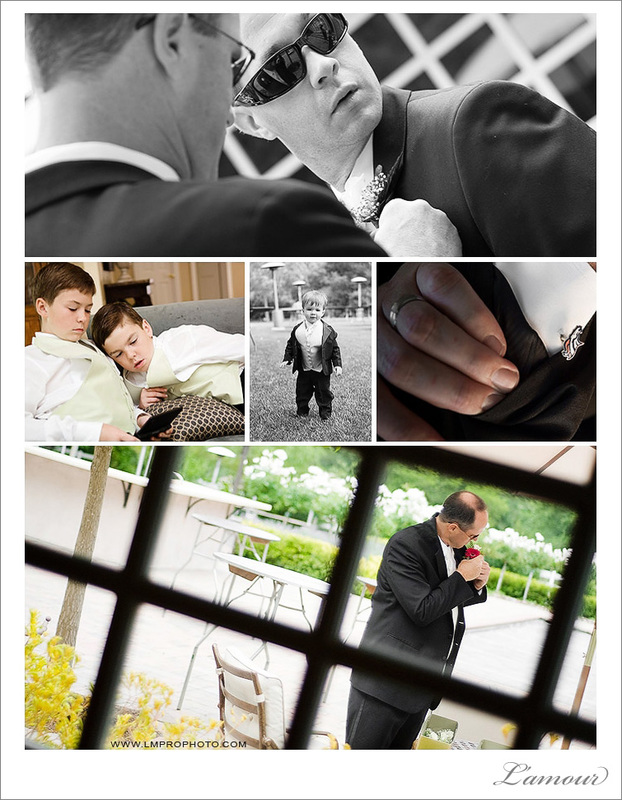 While the Girls wrapped up at the Salon, The guys were “getting ready” (read that as “relaxing”) at the Woodside Estate. 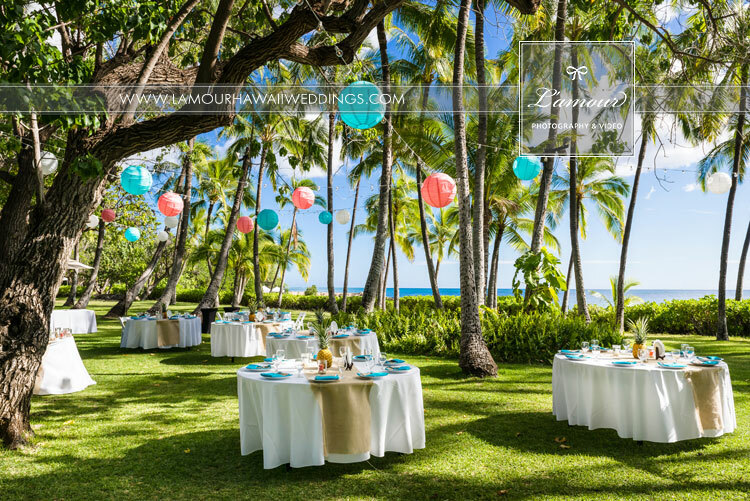 The ceremony area was set up, the tables were decorated, and the drinks were going on ice. 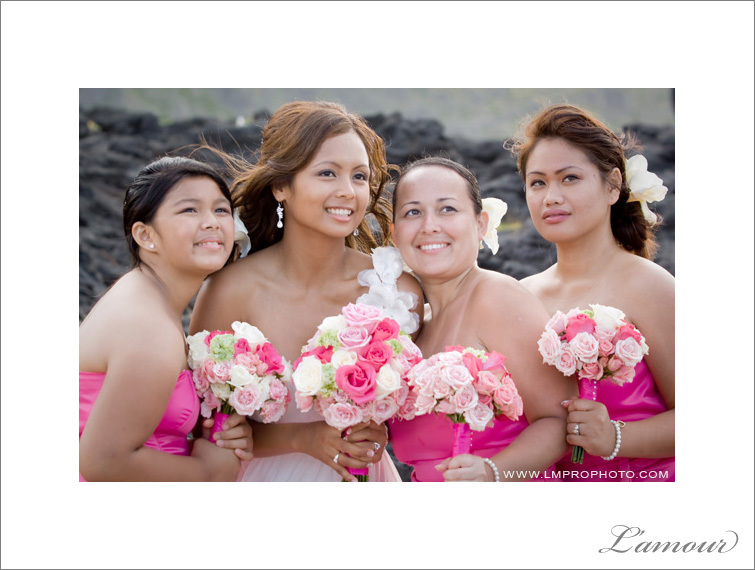 It was time for the ladies to show up. 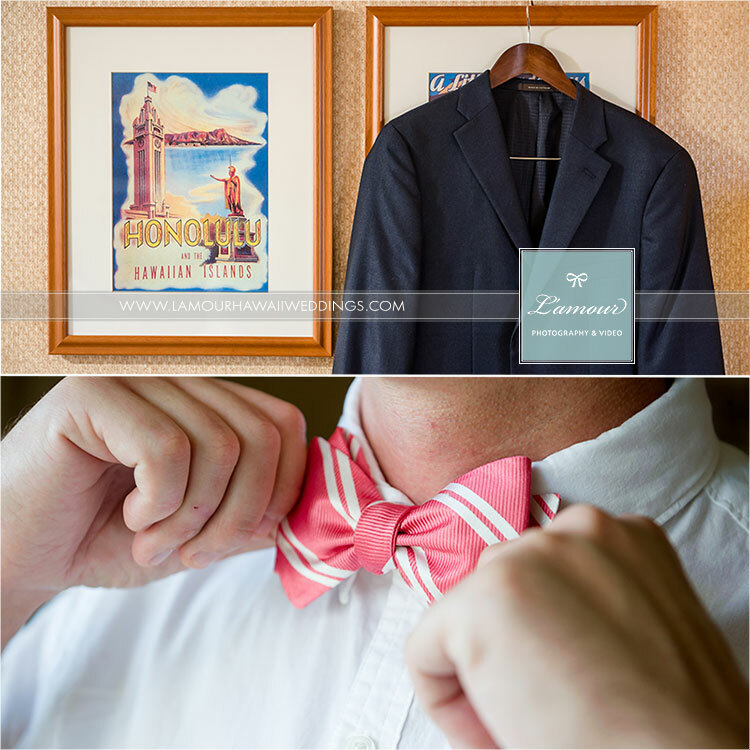 The Groom and groomsmen were dressed in black suits with light green striped ties with the bridesmaids in complimenting light green strapless dresses. 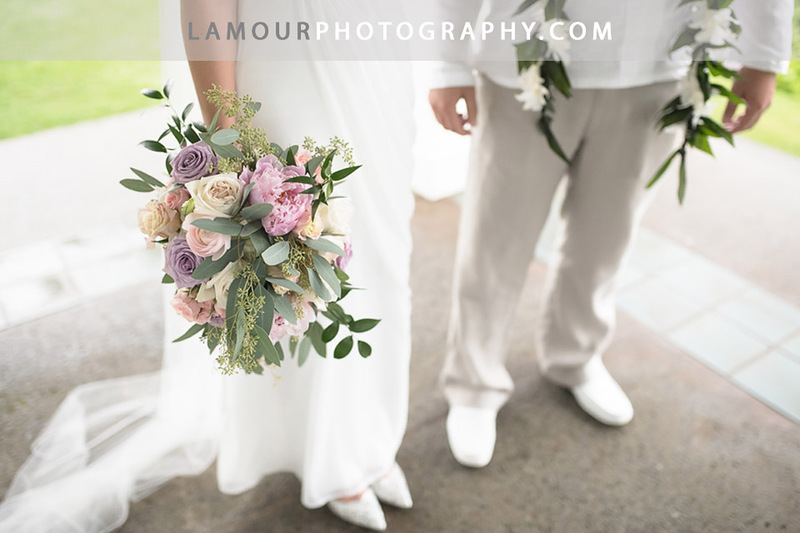 The bouquets included white roses, fuscia Gerber Daisies and Queen’s Anne Lace tied with sheer light green ribbon. 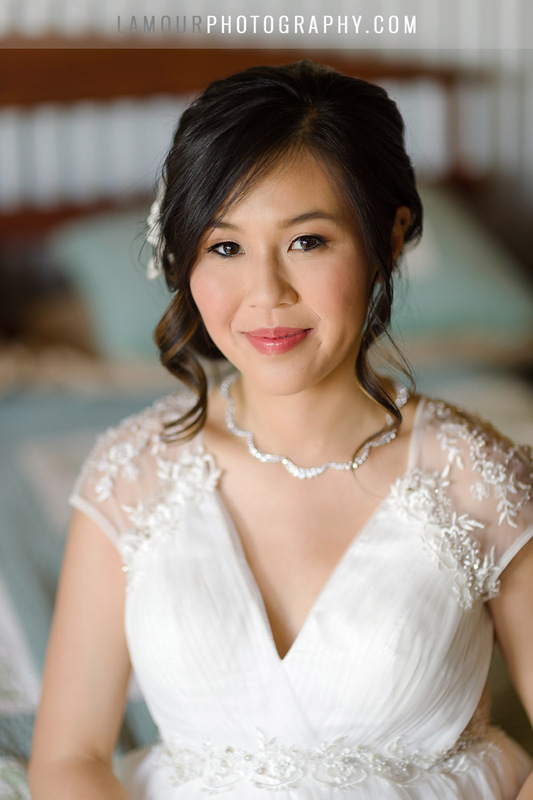 Stacey wore an elegant ivory gown with a corset back and an added personal touch with a broach pinned on the side. 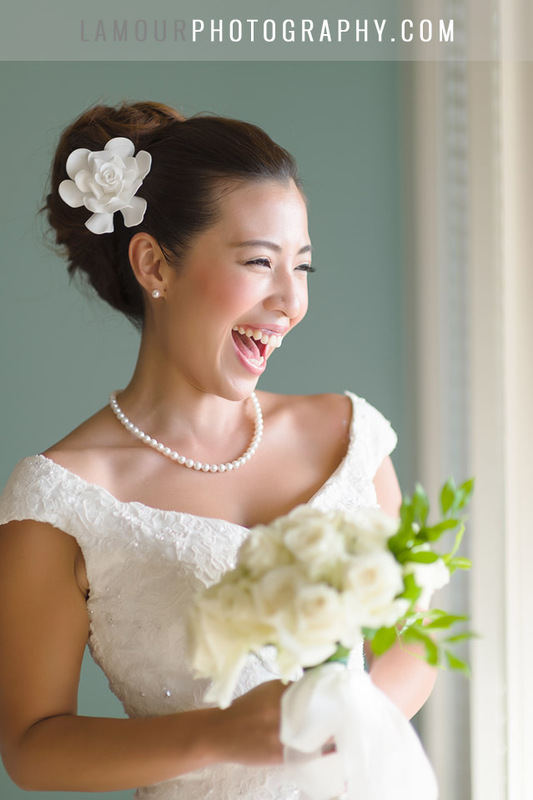 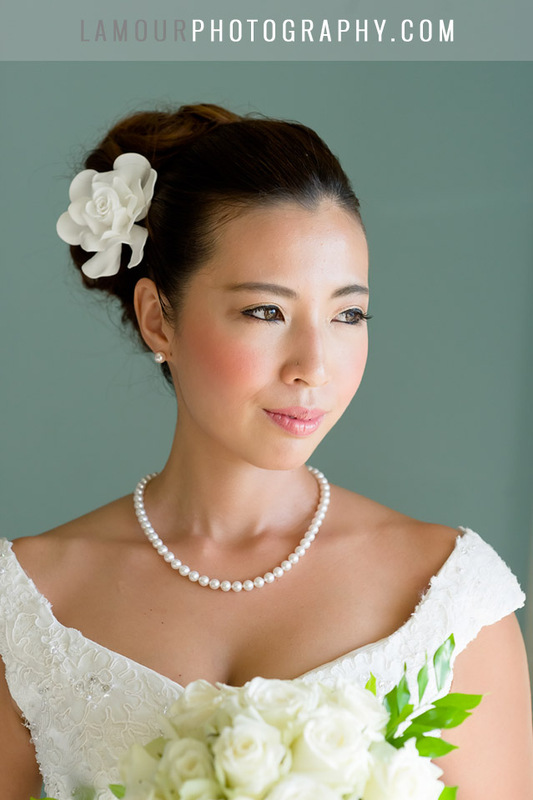 Her look was finished off by her “something old” pearl earrings and necklace. 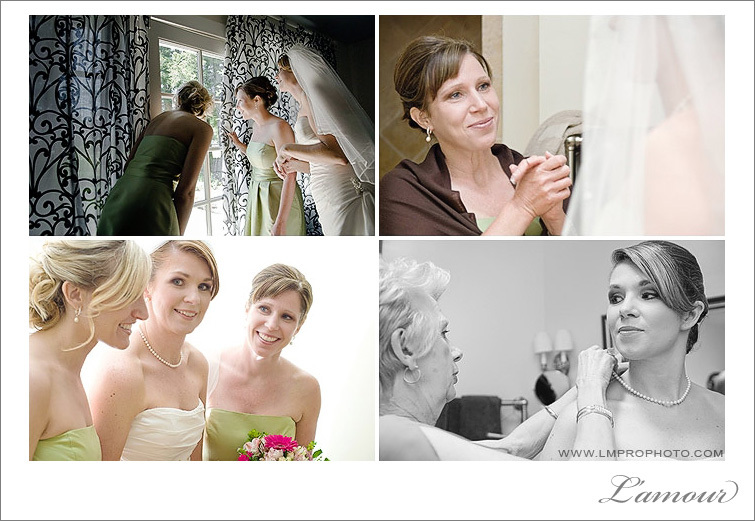 It was great to see all the bridesmaids and the mother of the bride standing around Stacey in complete awe. 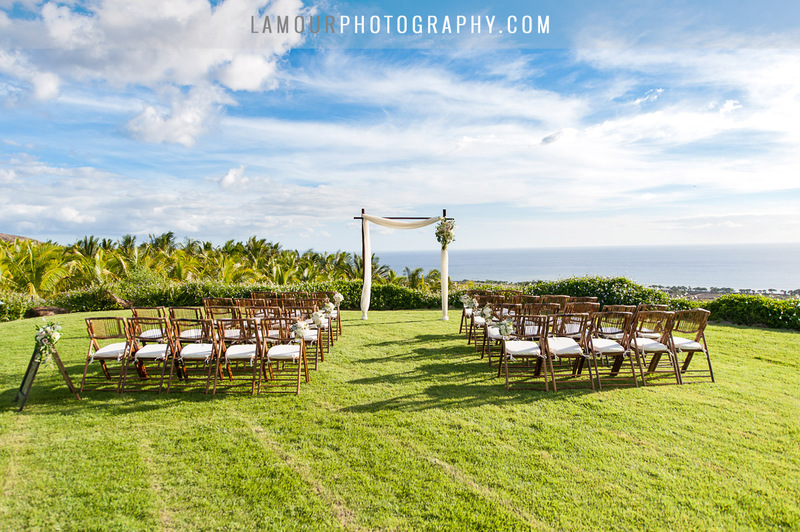 The ceremony was held on the expansive lawn on the edge of a vineyard. 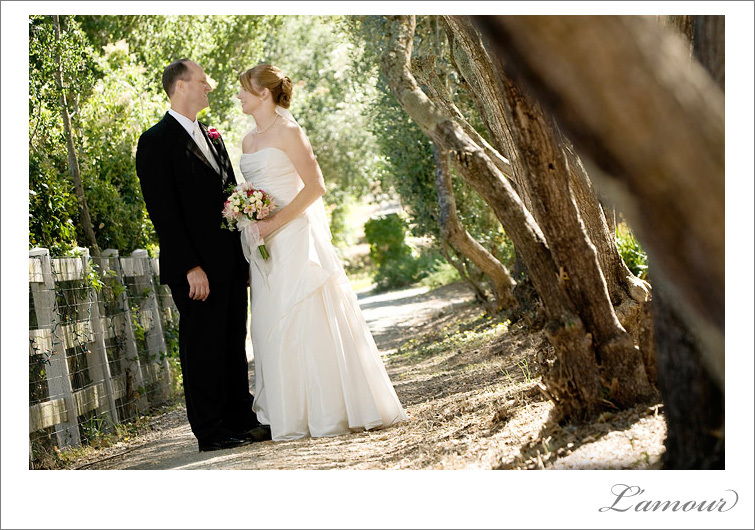 The surrounding rolling hills and clear blue skies really reminded us of what we love about northern California. 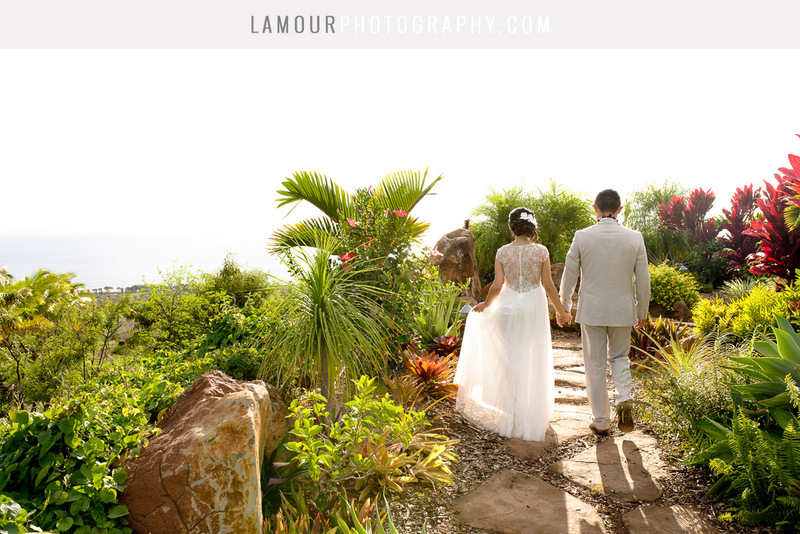 After the ceremony, the guests were ushered poolside for a cocktail hour while we escaped into the nearby vineyard with Stacey & Steven for portraits. 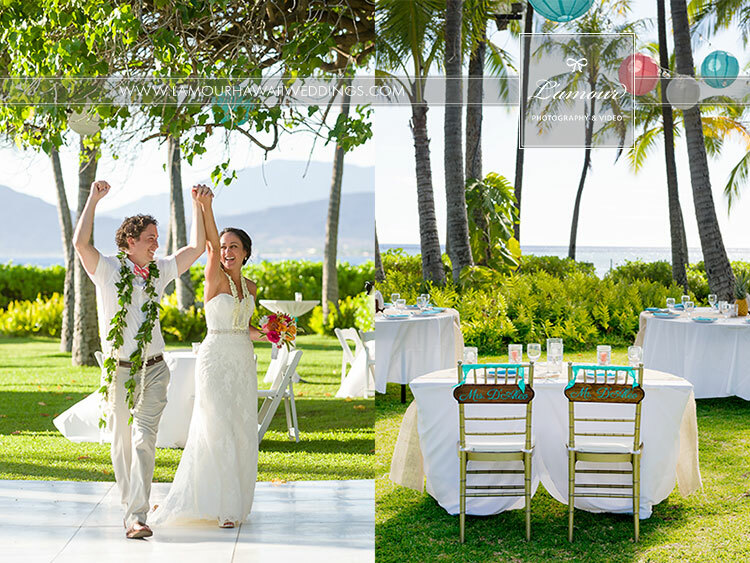 When we came back, the guests were invited to sit at their tables and the wedding party was introduced. 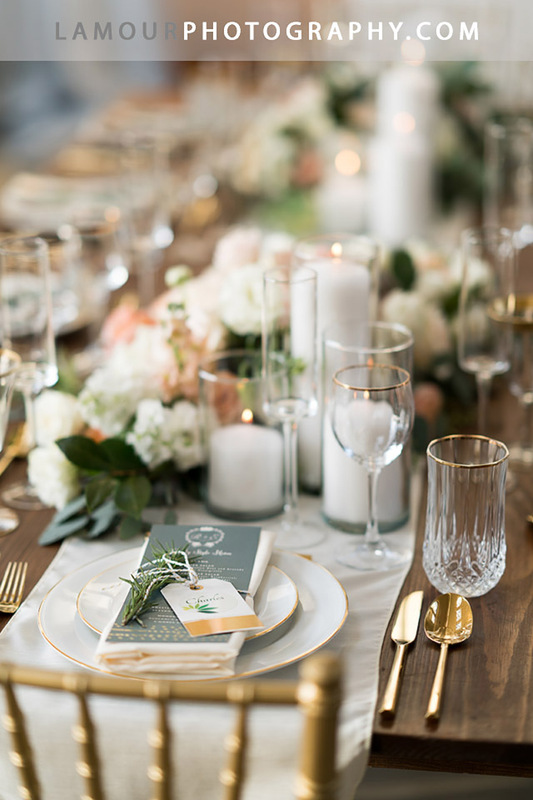 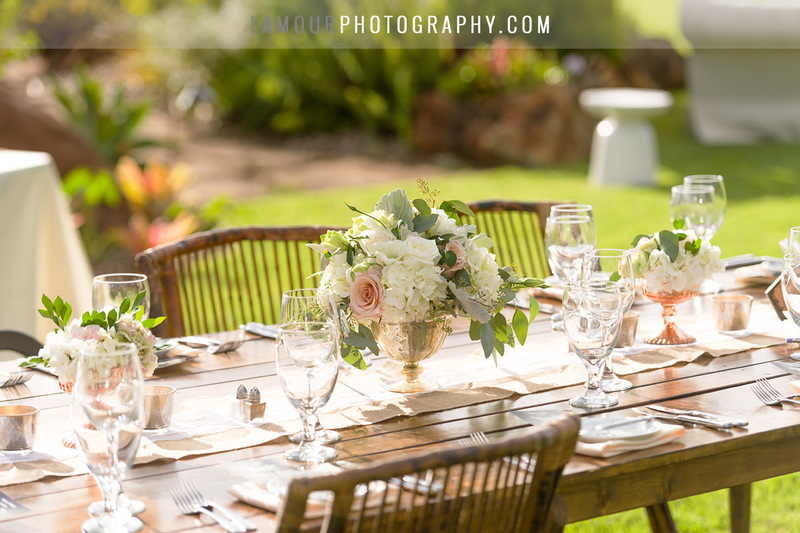 The tables were adorned with dark brown satin table clothes, mirrored centerpiece bases, and floral arrangements featuring personalized table signs of Stacey and Steven’s favorite places in the world. 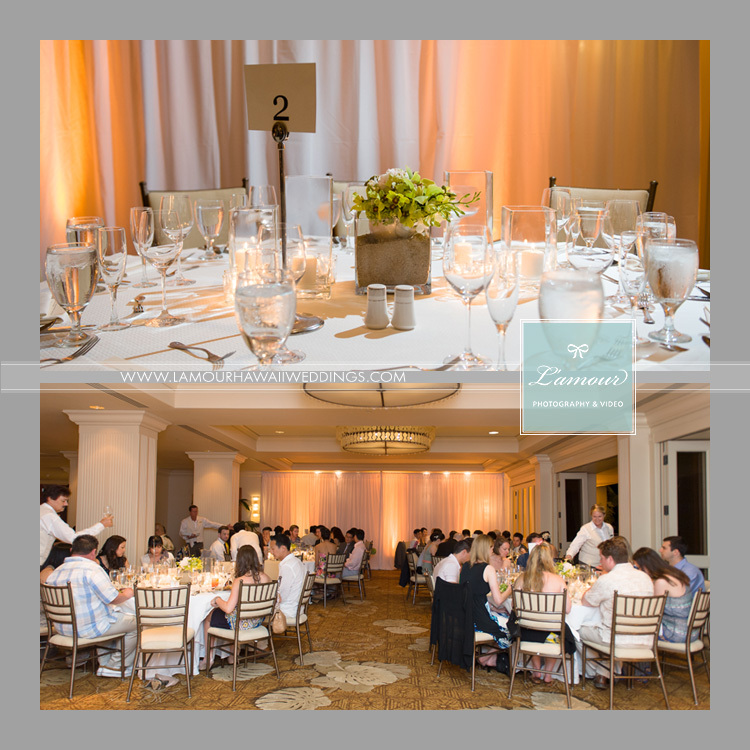 The food and drinks were provided by Cafe Primavera Catering which is amongst the best catered food we have ever tasted in any state we have photographed in. 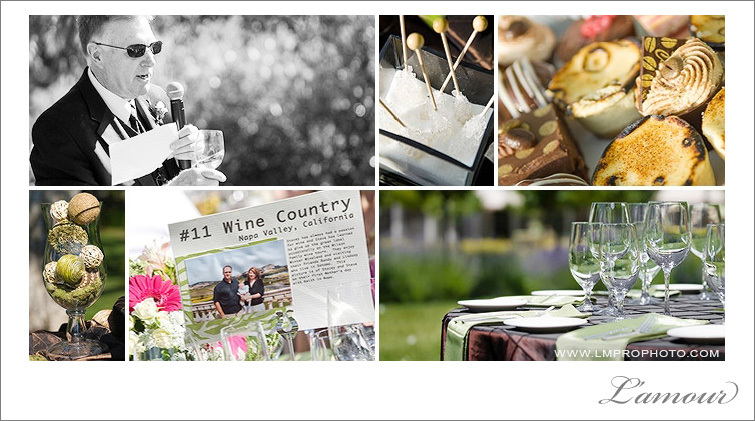 With food served and the wine flowing, Stacey’s father took the mic to begin the speeches. 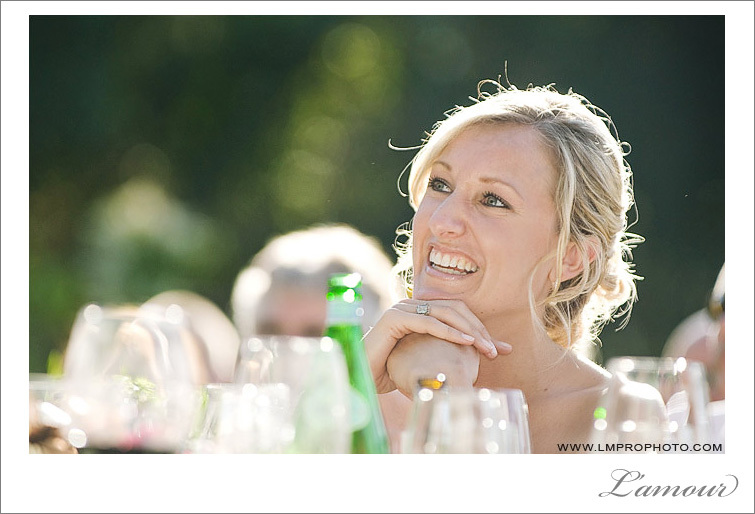 Reception speeches are one of my favorite times during a wedding. 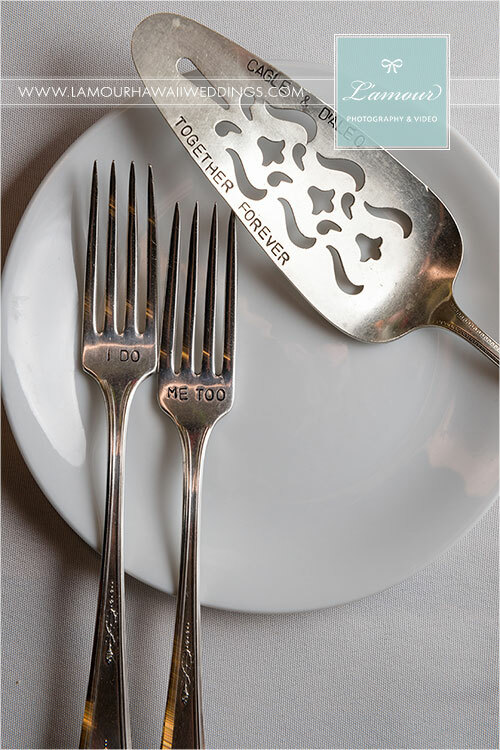 It is at this time, where family and friends share the most thoughtful and meaningful sentiments. 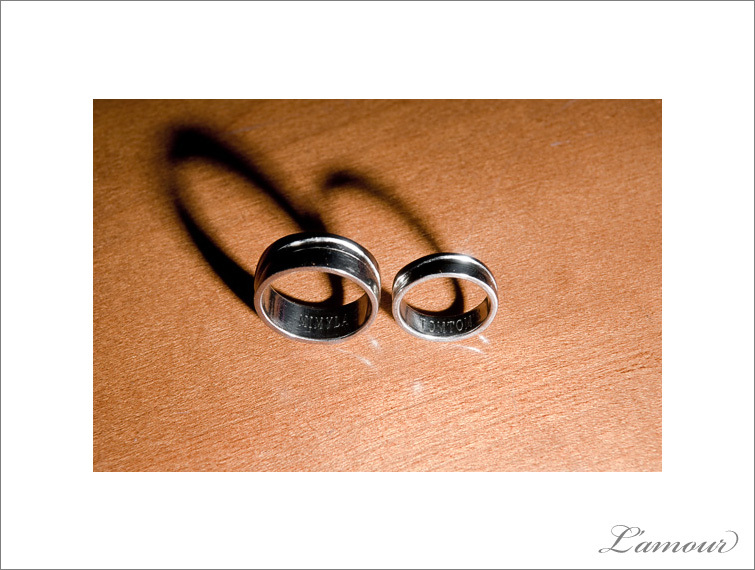 In the course of a lifetime, these are the words that are likely to be the most important that you will ever hear. 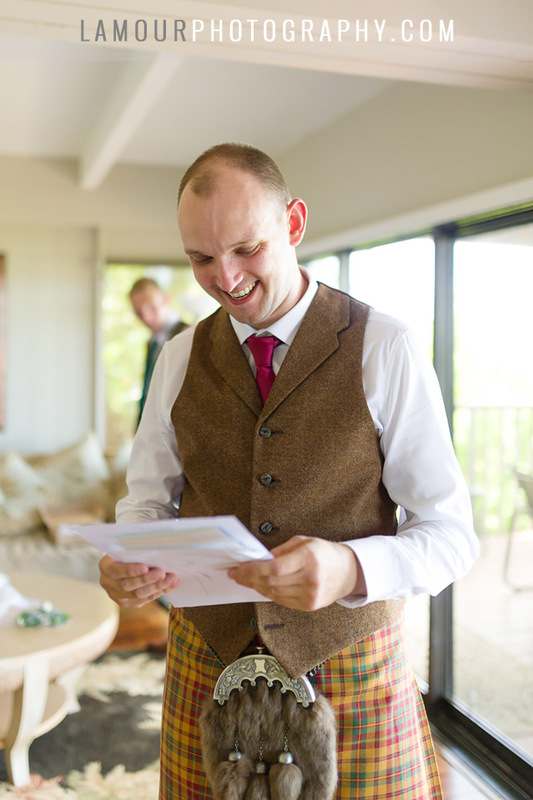 Stacey and Steven’s family and friend’s speeches were no exception. 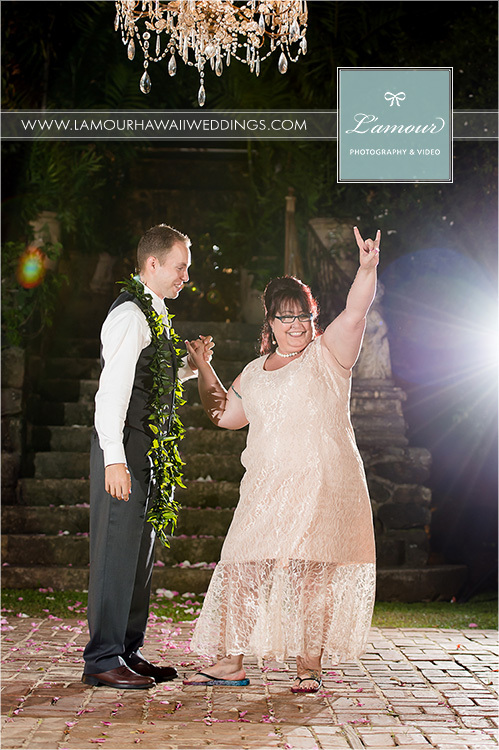 Following the speeches, Stacey & Steven stepped onto the dance floor for their first dance. 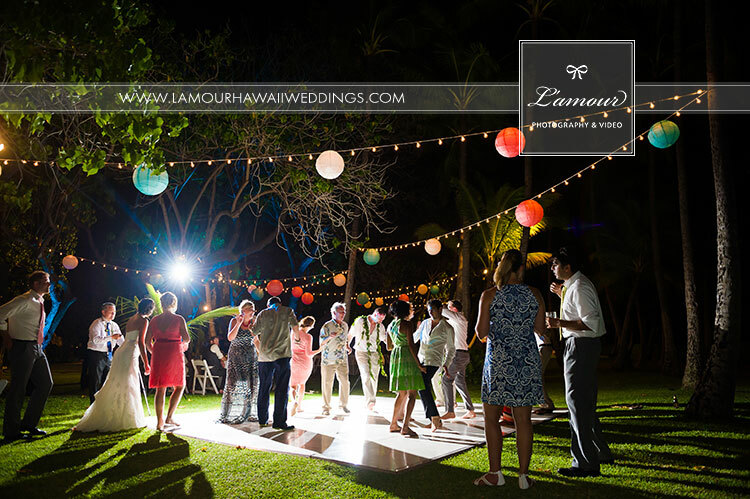 We were impressed that immediately after the first dance, mother/son, and father daughter dances, almost all the guests rushed the dance floor. 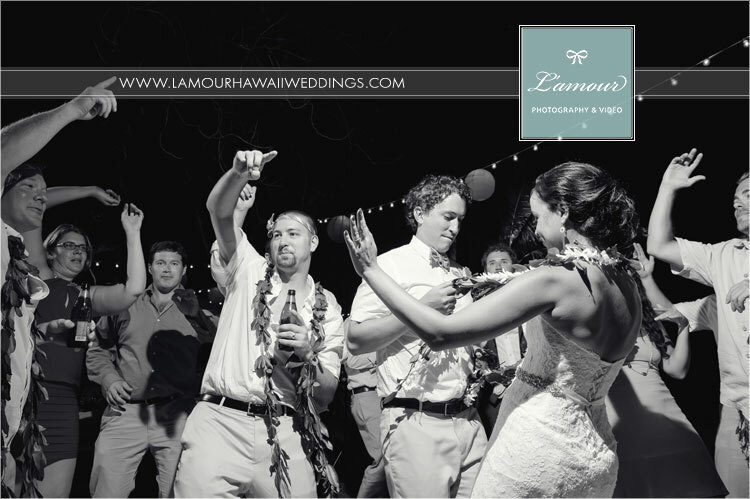 The lively guests and wedding party danced all night to the beats of DJ David from Brad Kinney Productions. 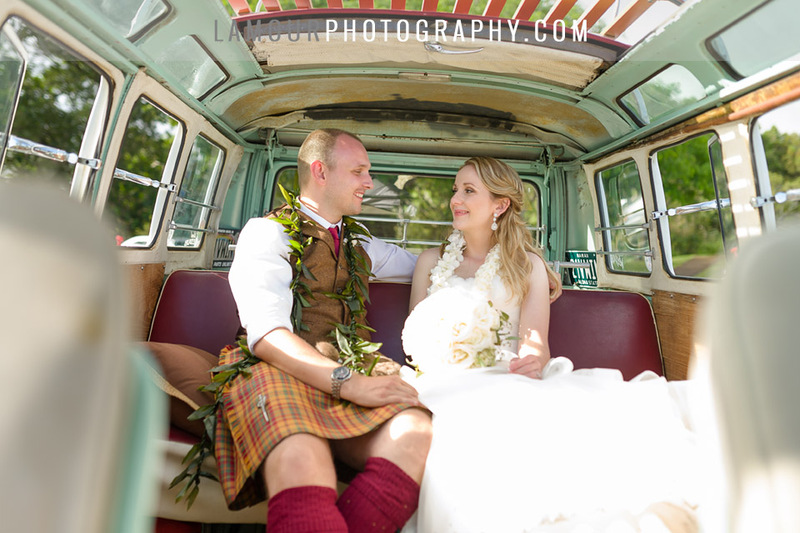 Traveling to Northern California for Stacey and Steven’s wedding was definitely a highlight of our year. 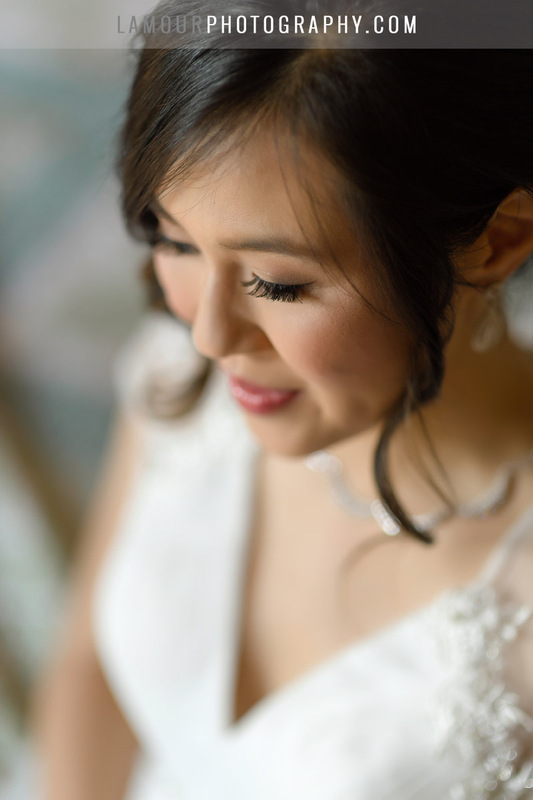 I appreciate when brides step out of the limits of a traditional wedding and personalize the wedding so that it is a true reflection of their life and style. 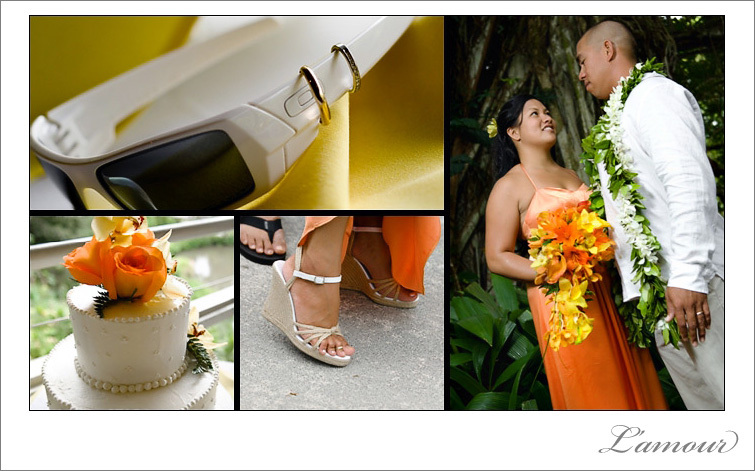 Anela wore a beautiful orange silk sheath dress for her garden wedding. 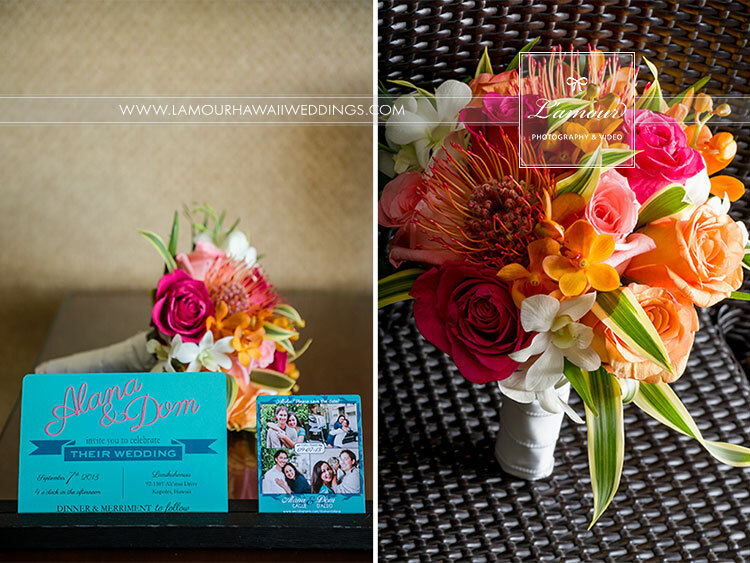 The bouquets were a complimentary mix of yellows and oranges that went perfectly with her dress. 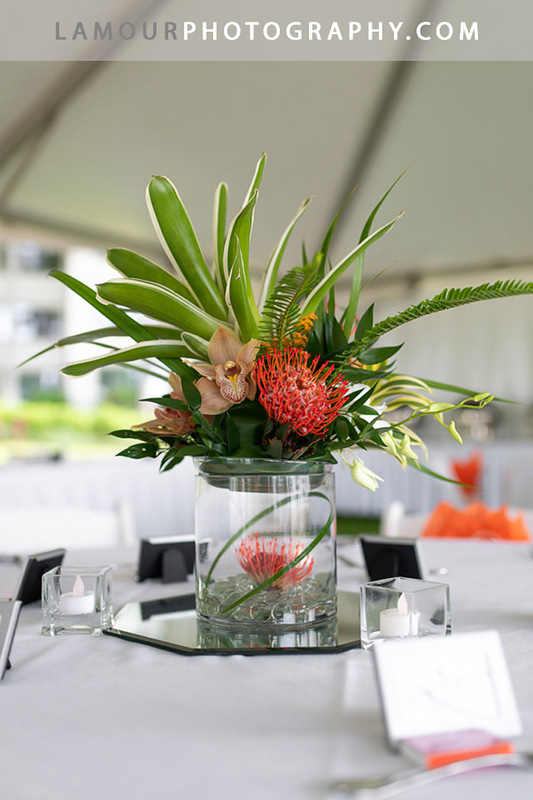 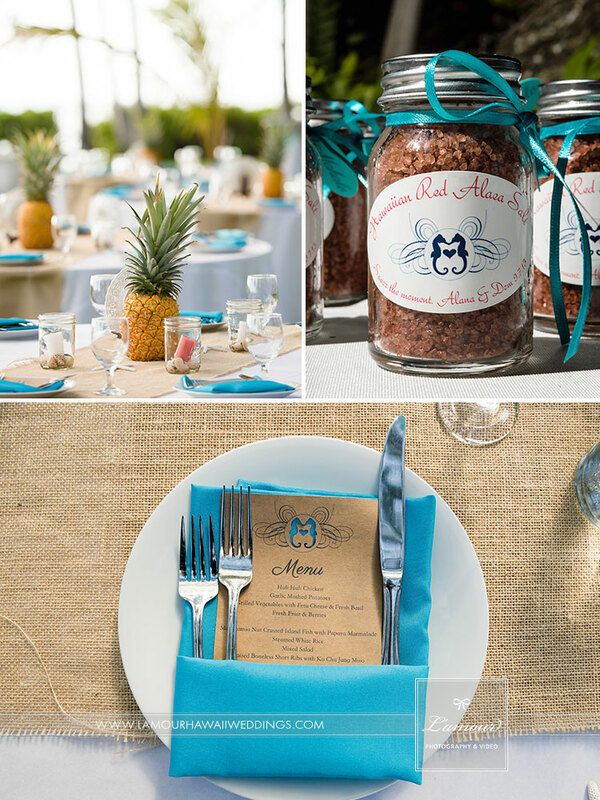 We have been seeing more and more orange in wedding color schemes lately. 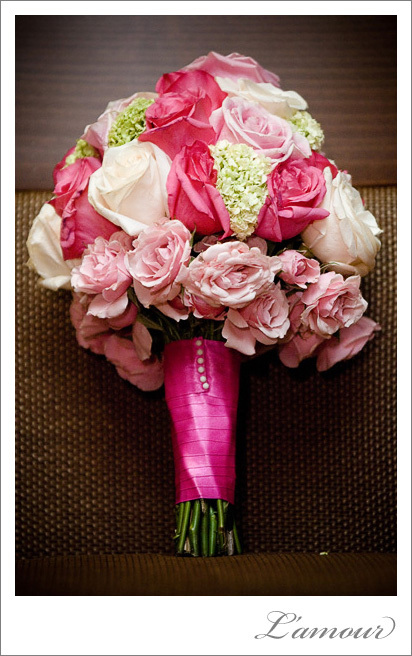 Even Martha Stewart digs this Anela’s color choices as seen in a recent article online. 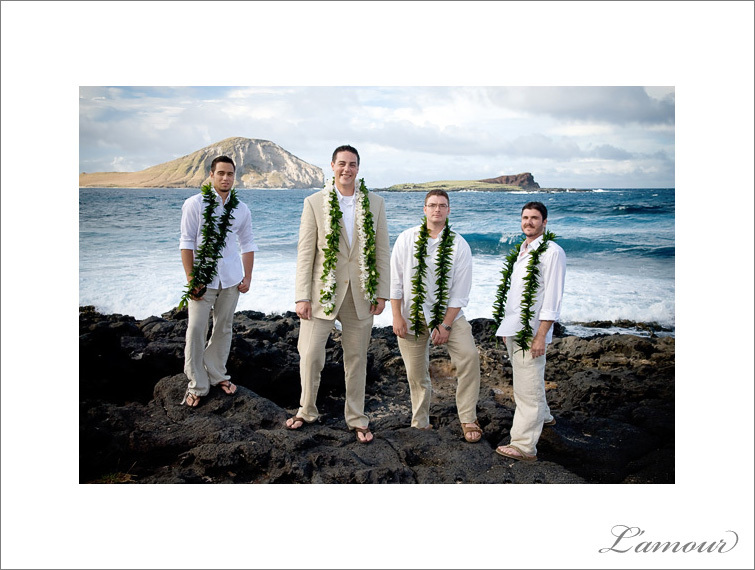 Ikaika went with a more traditional white aloha shirt paired with his white Oakley sunglasses. 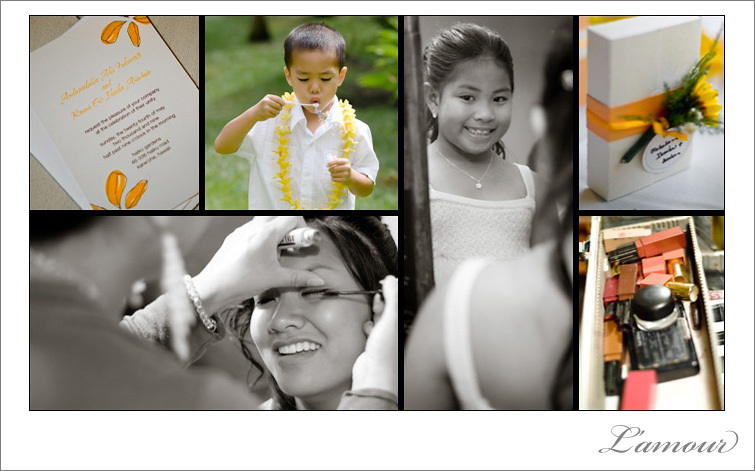 Anela’s daughter serenaded the girls as they got their hair and makeup done by singing Bob Marley’s Three Little Birds. 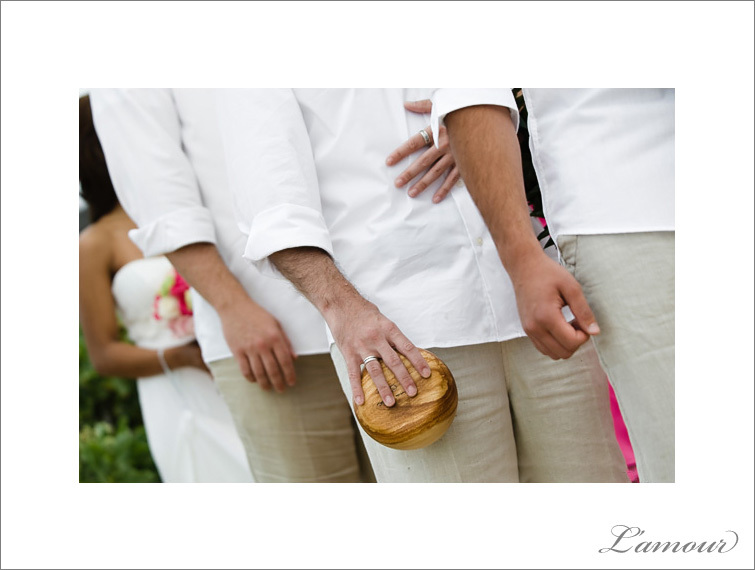 So funny! 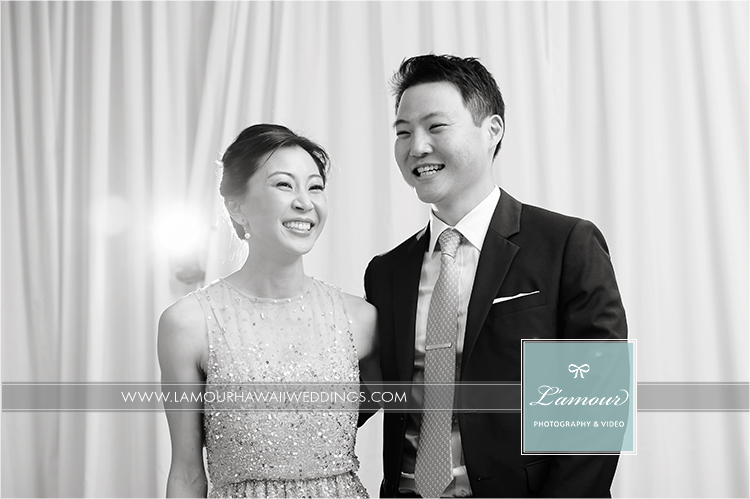 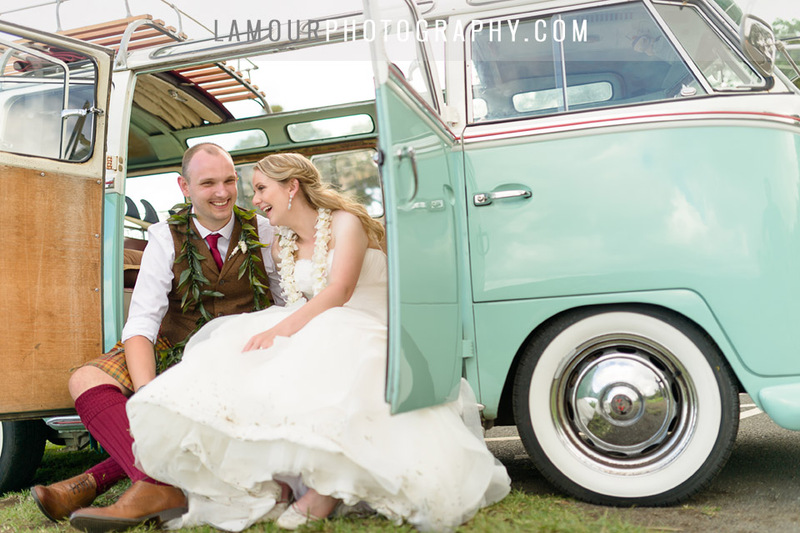 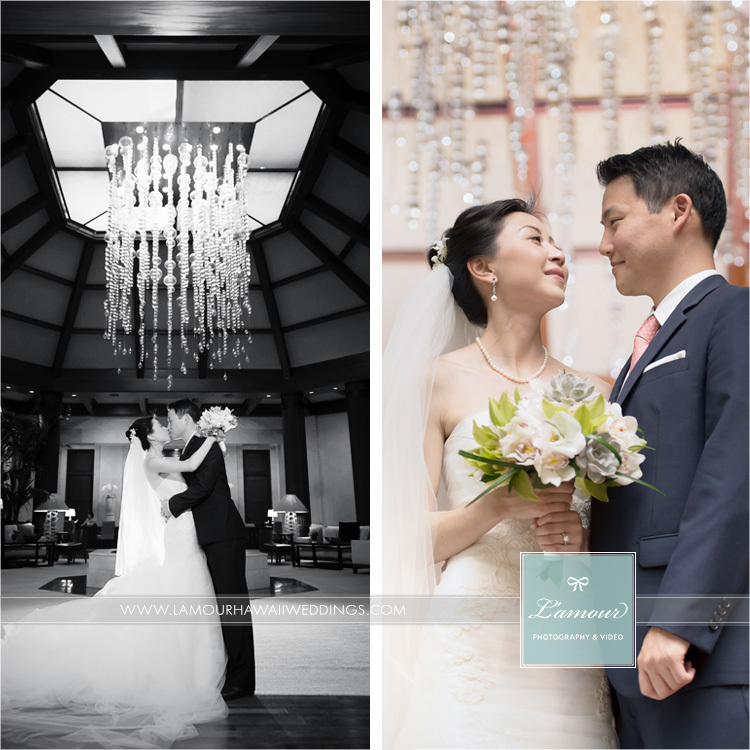 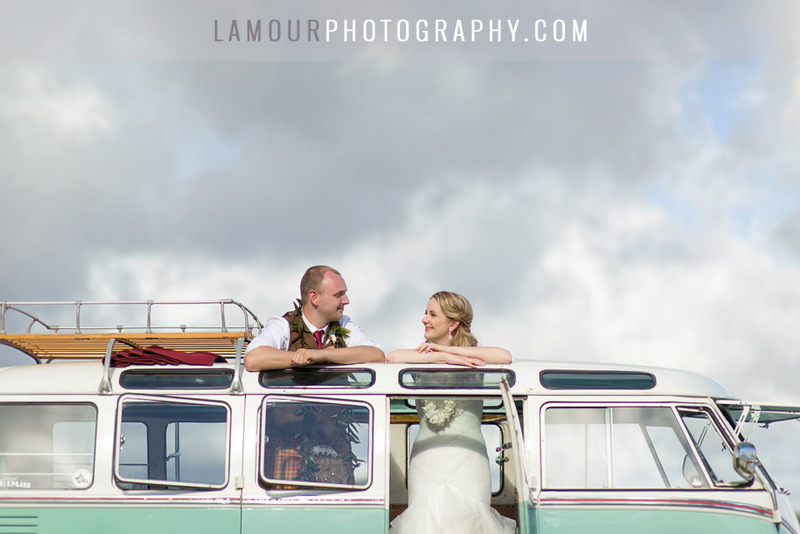 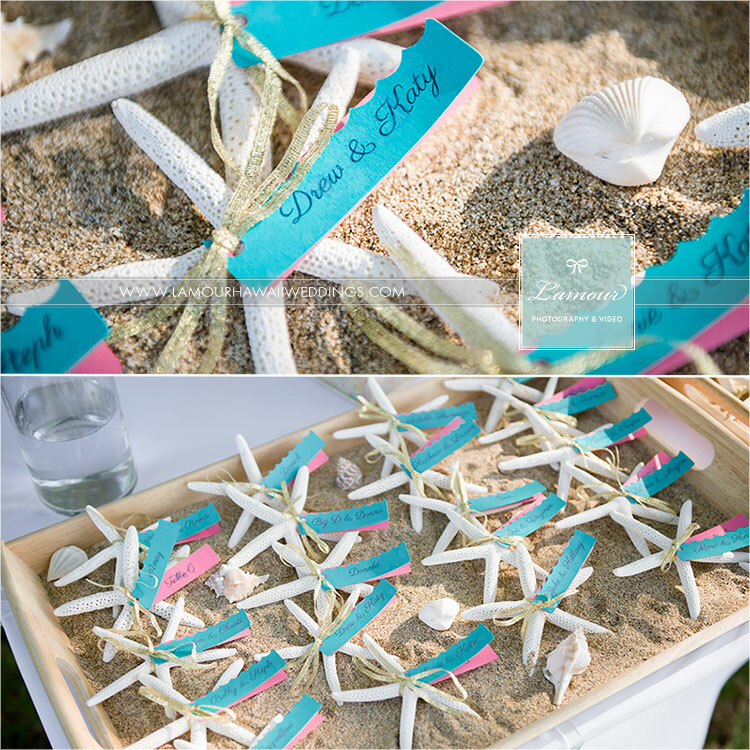 We were so happy to meet such a sweet couple and to be part of their big day! 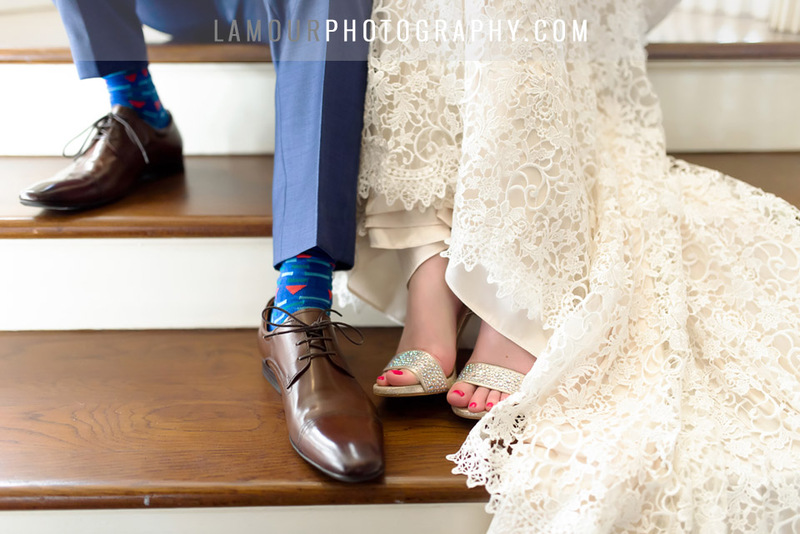 Congratulations to Amanda and Jeff! 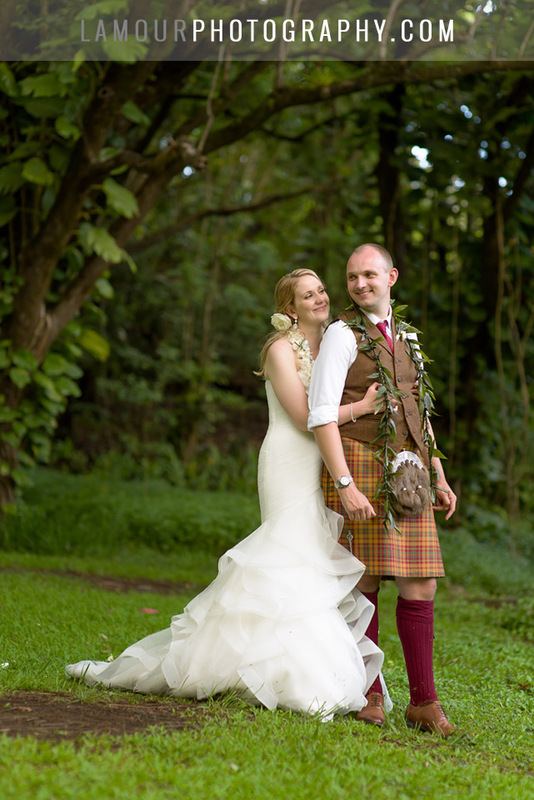 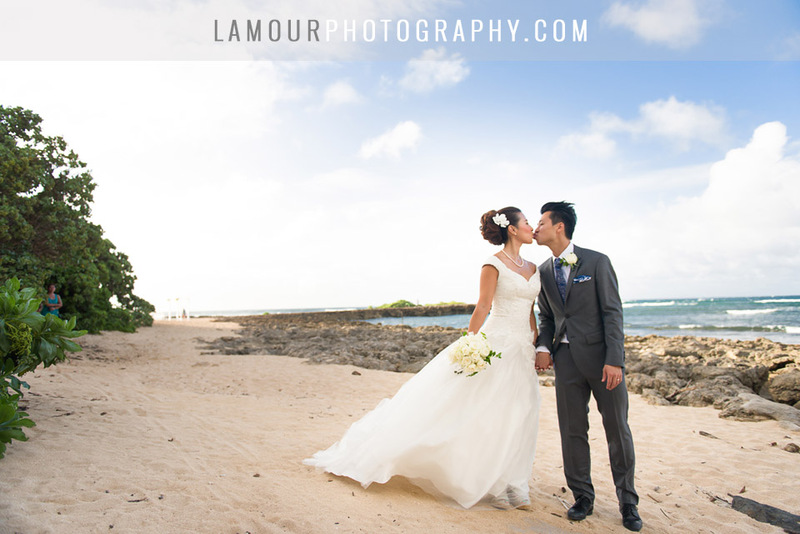 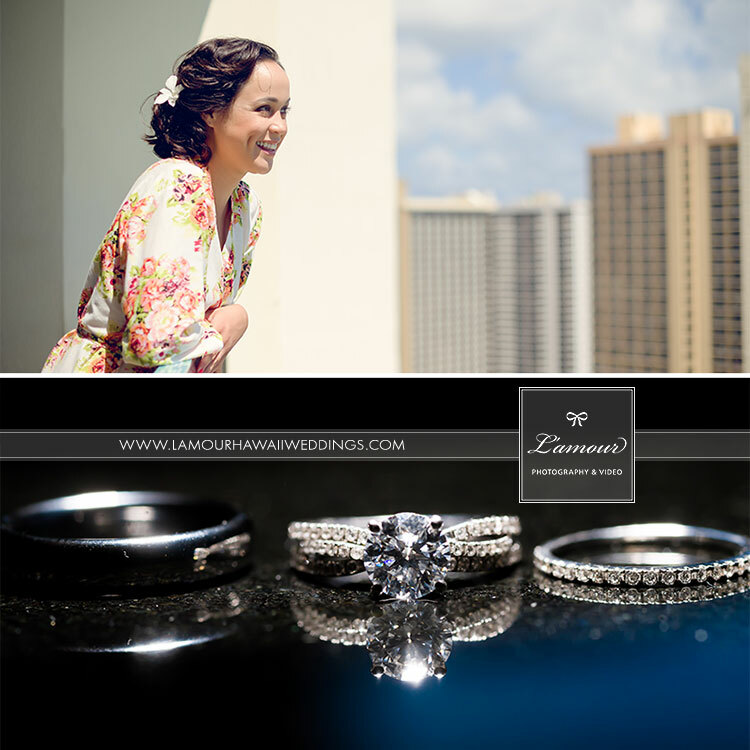 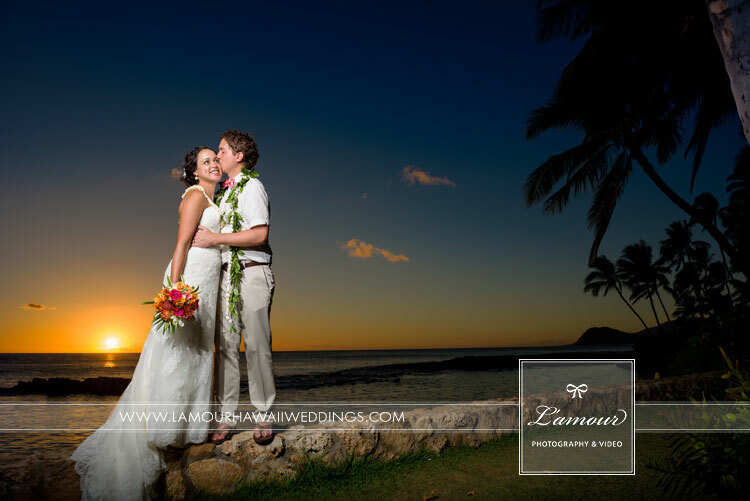 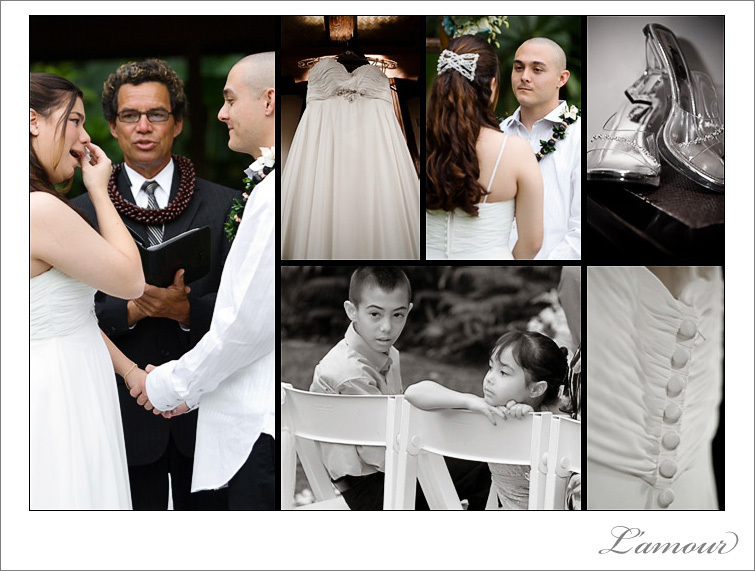 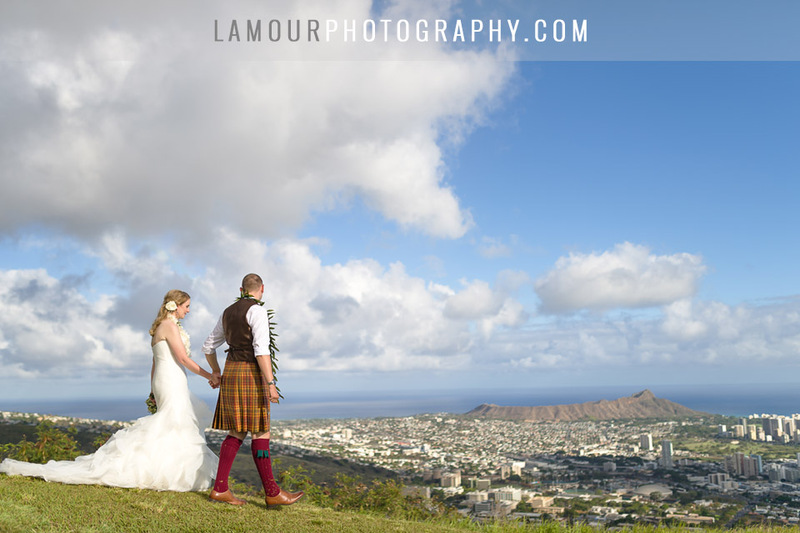 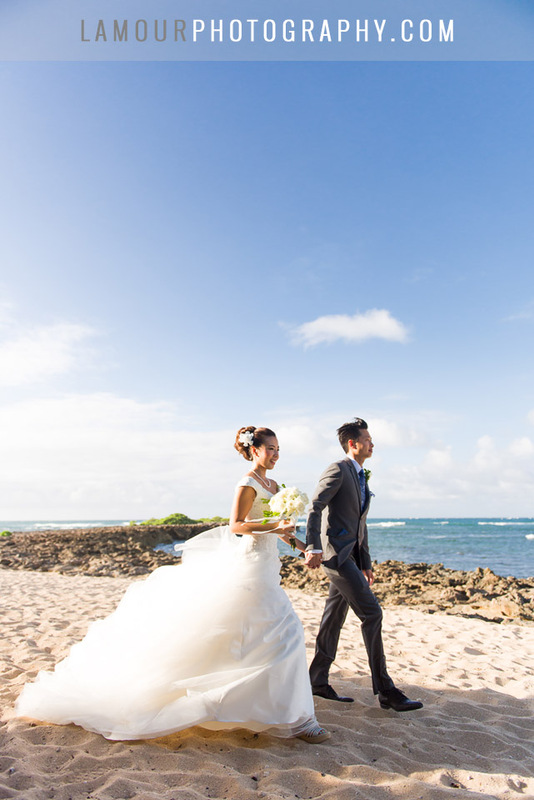 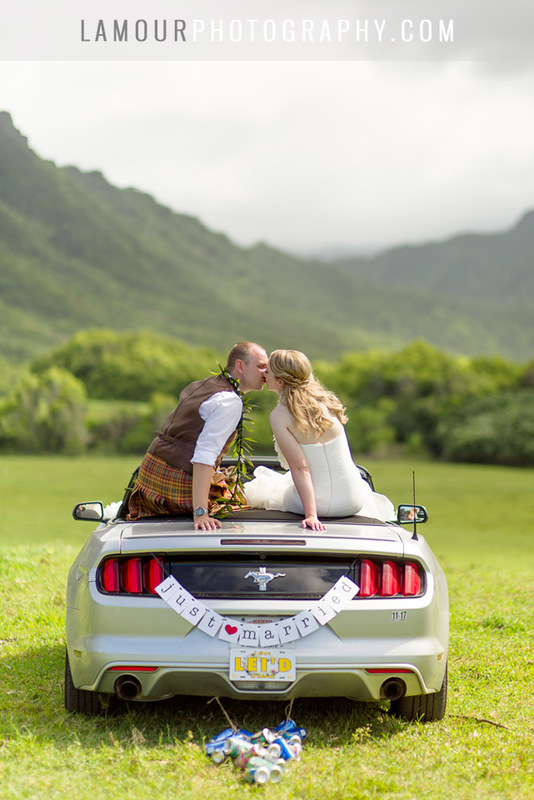 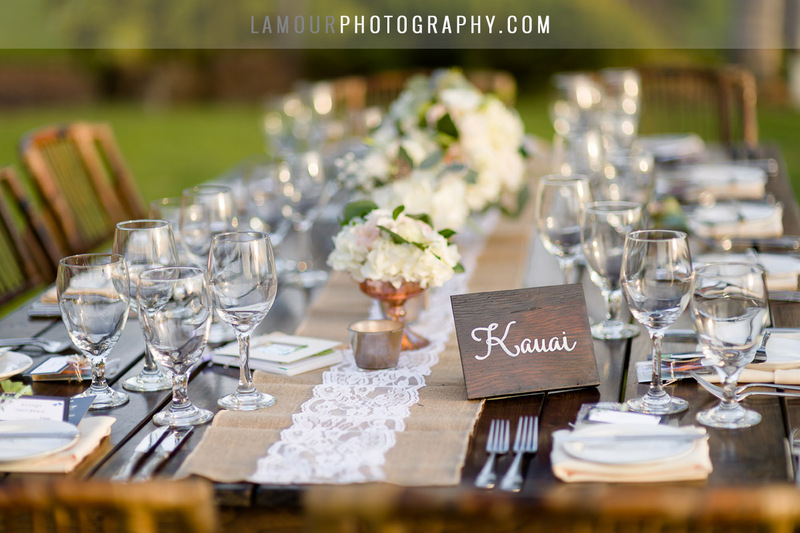 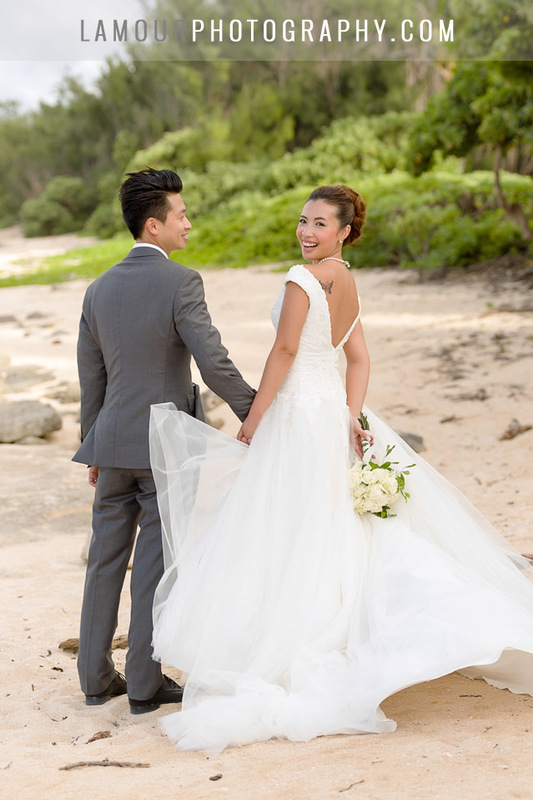 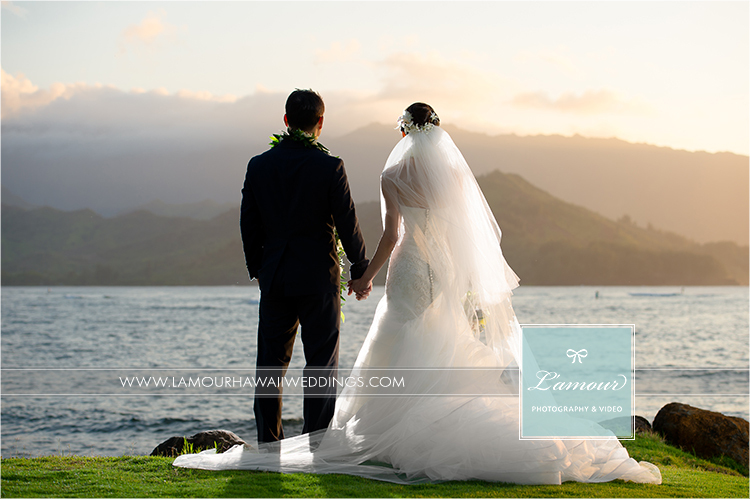 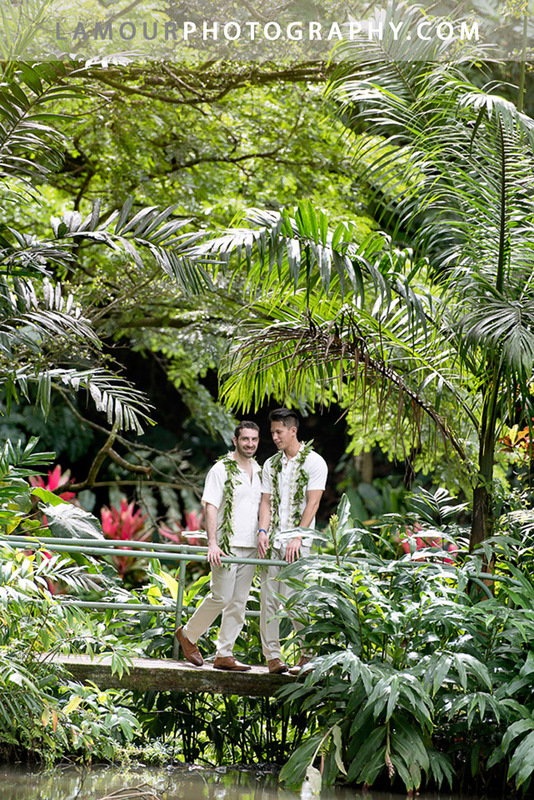 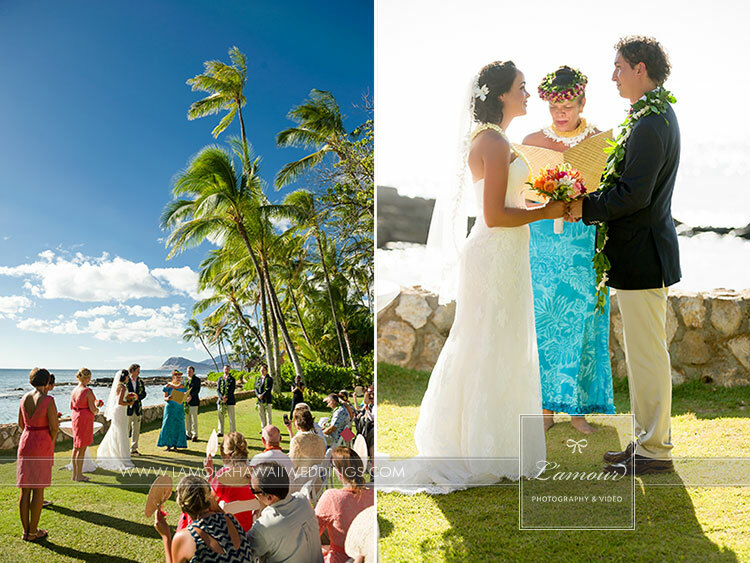 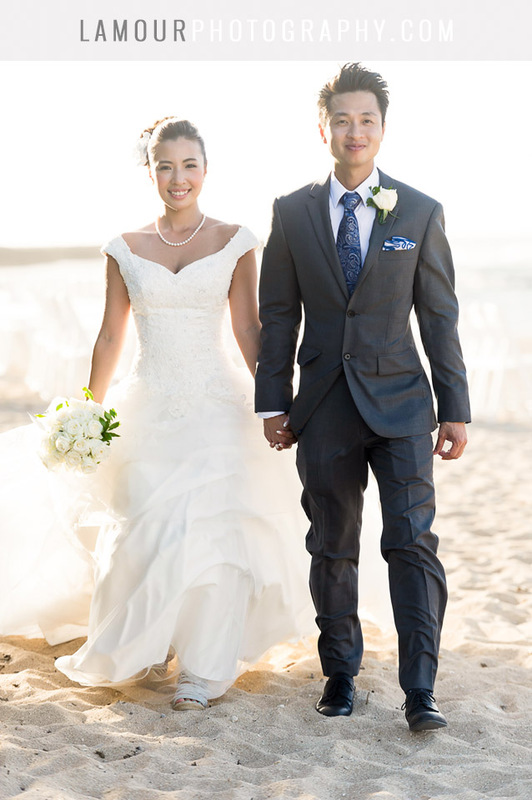 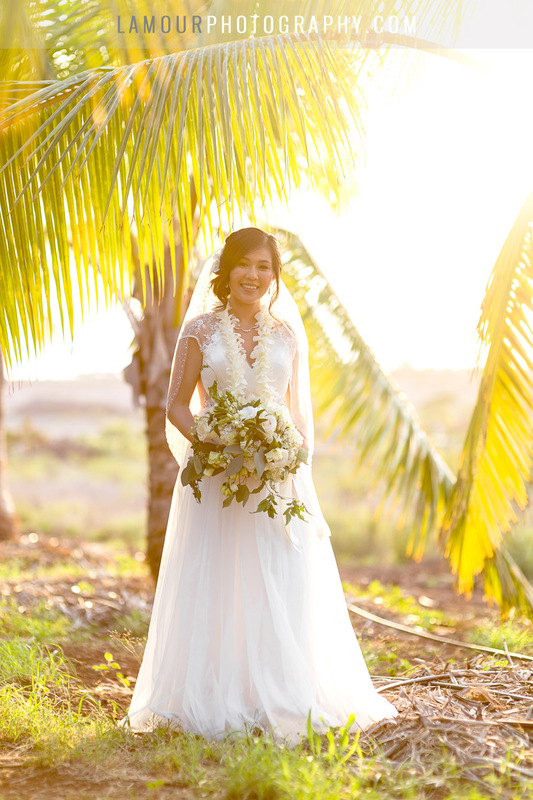 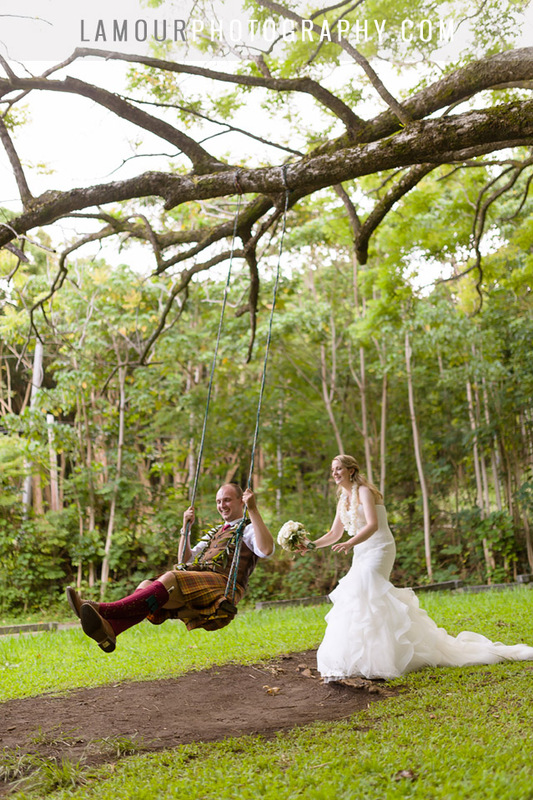 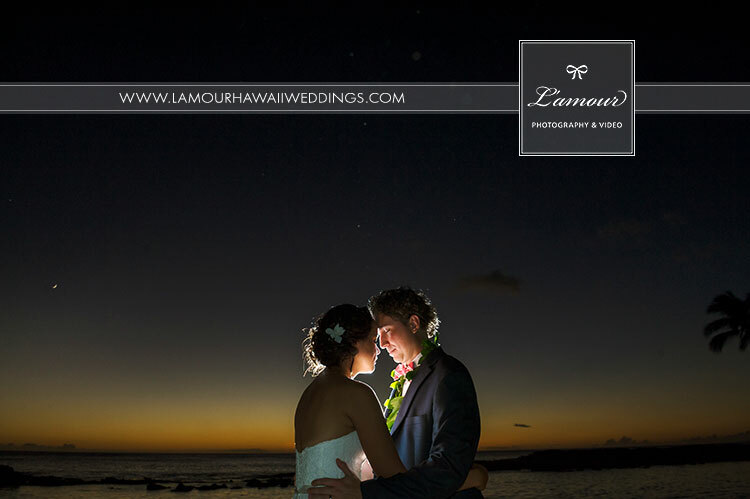 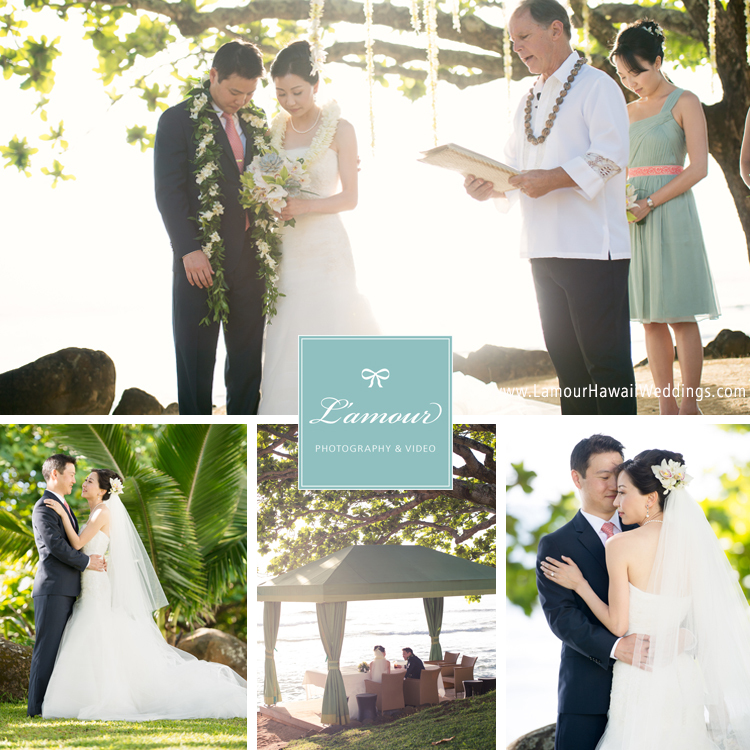 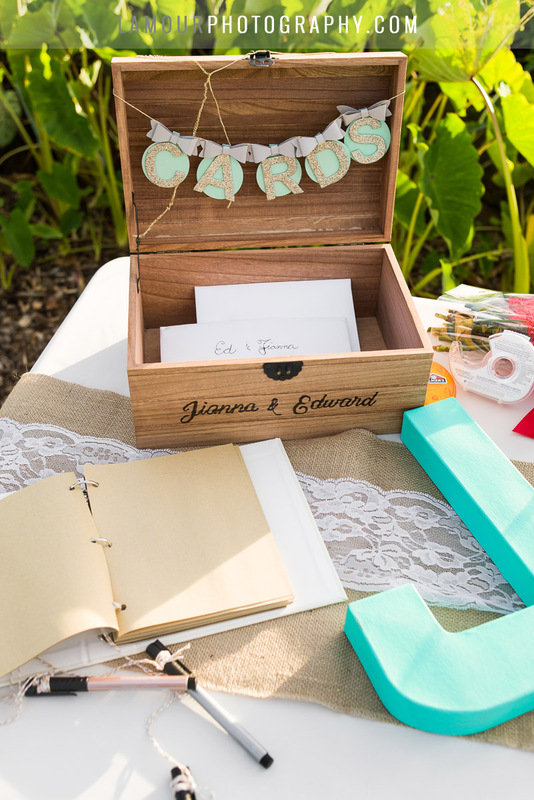 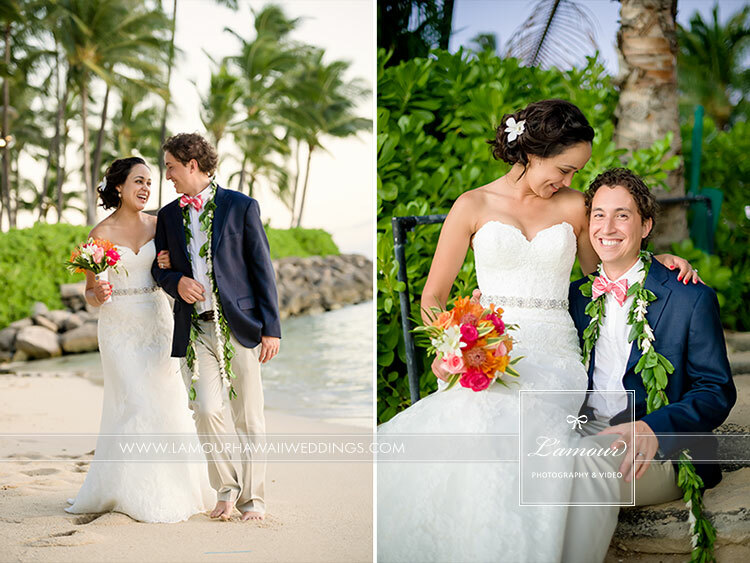 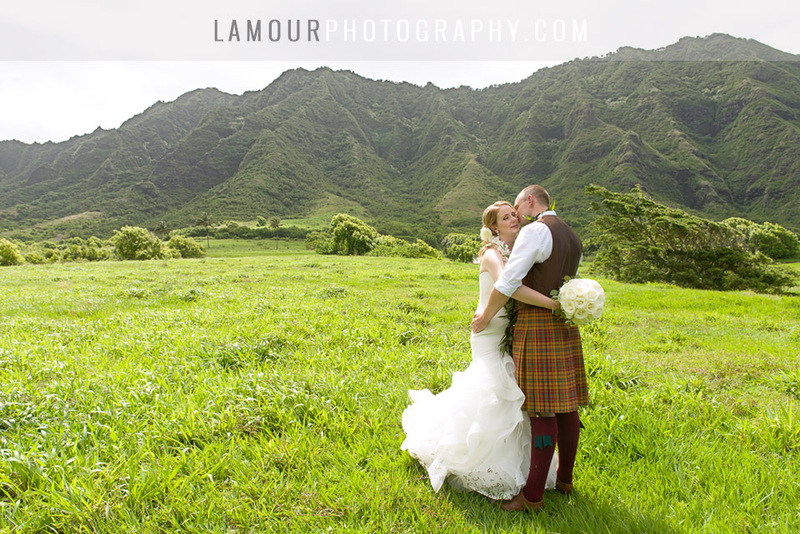 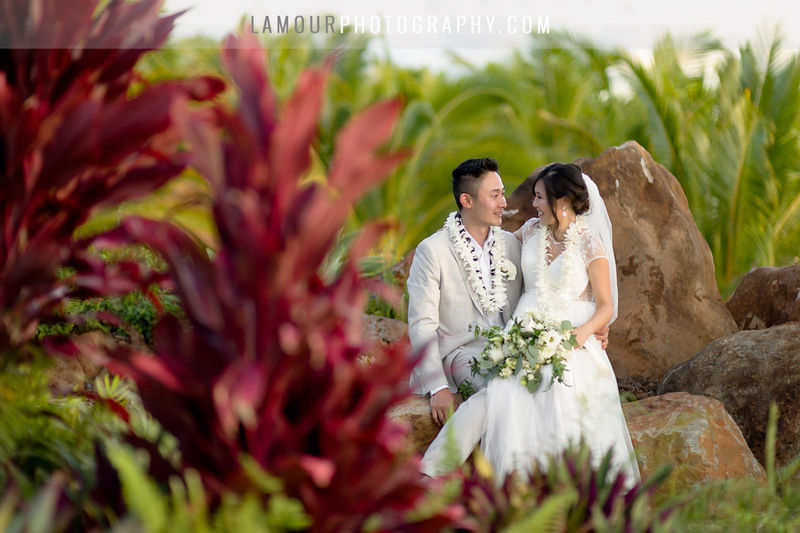 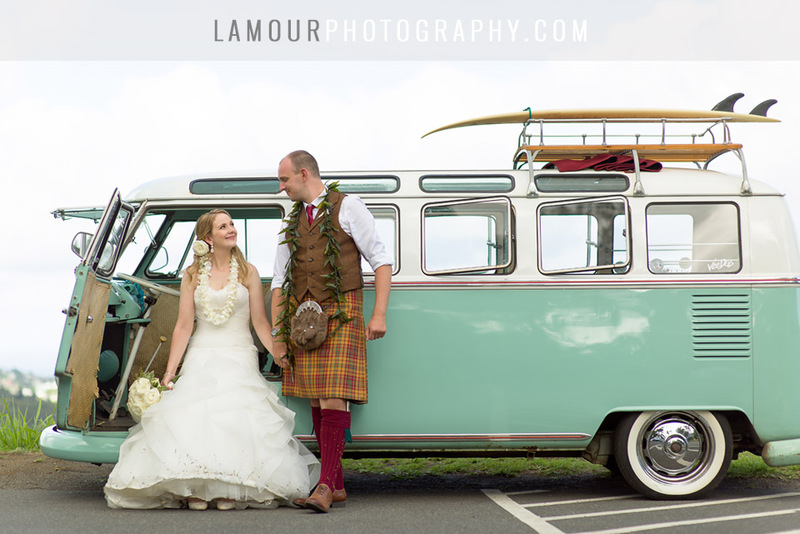 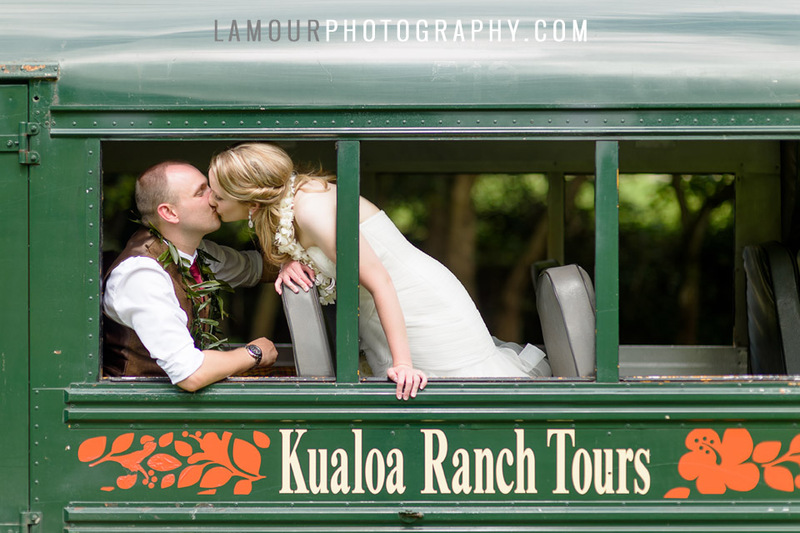 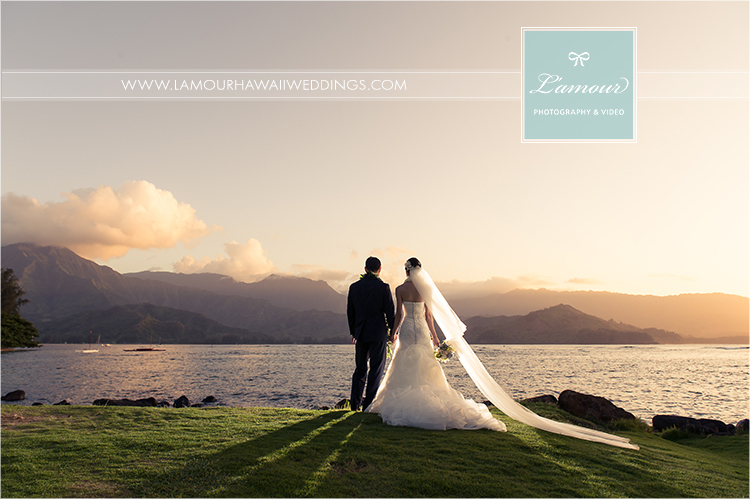 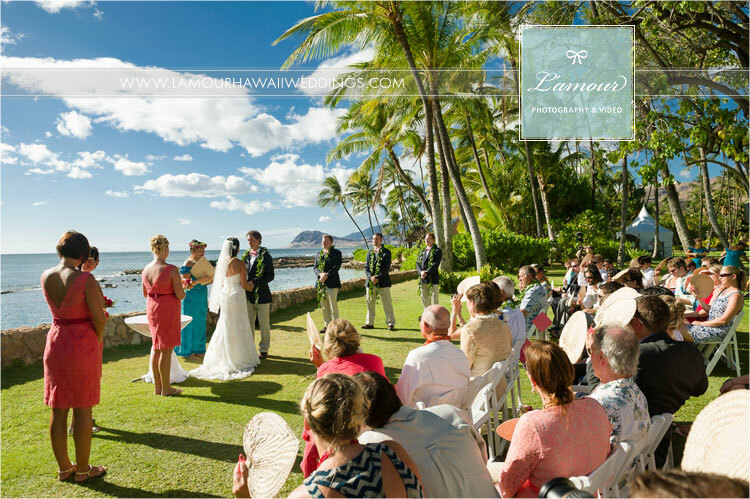 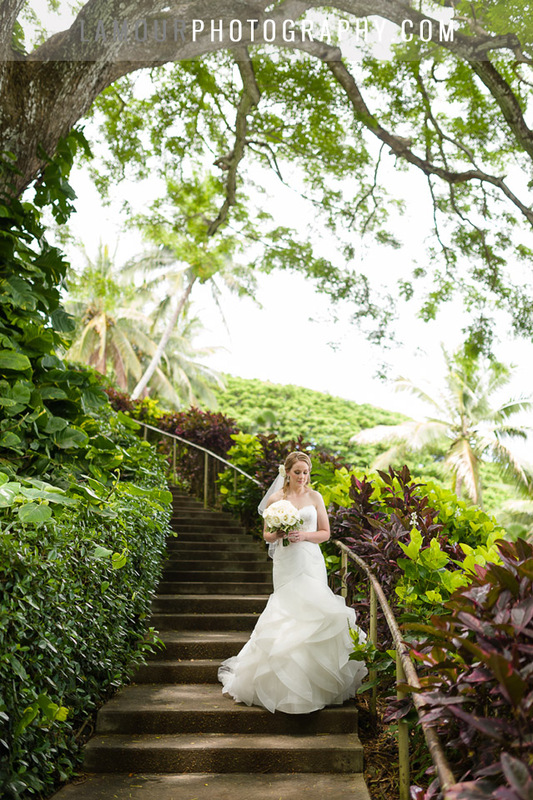 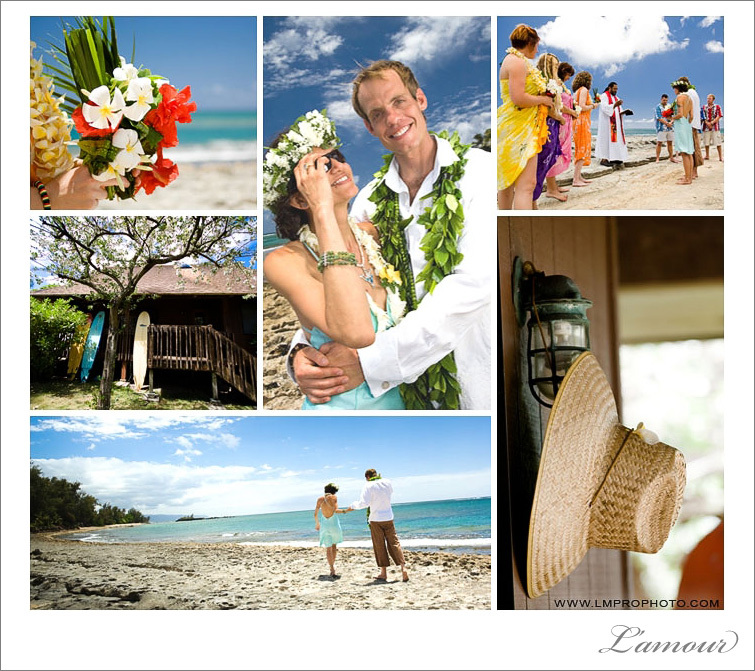 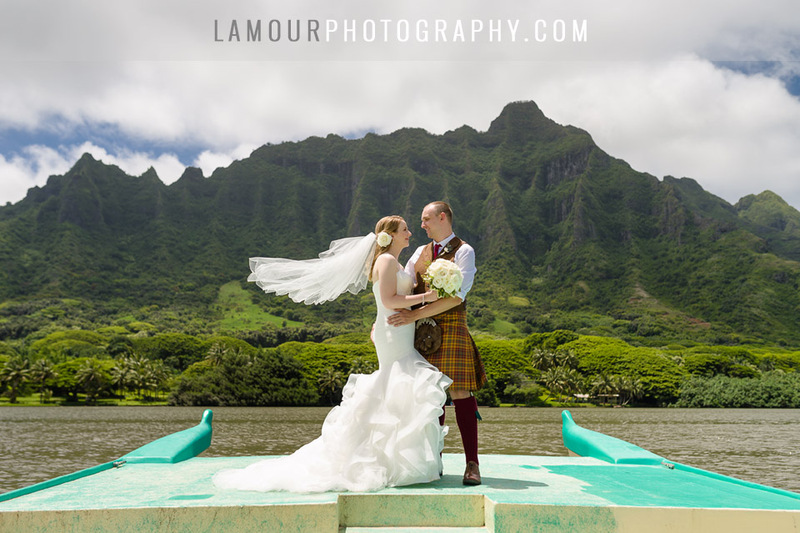 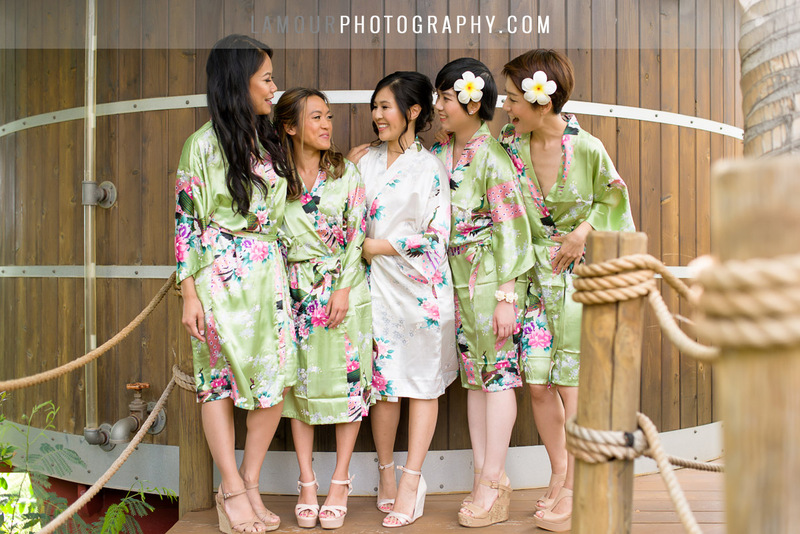 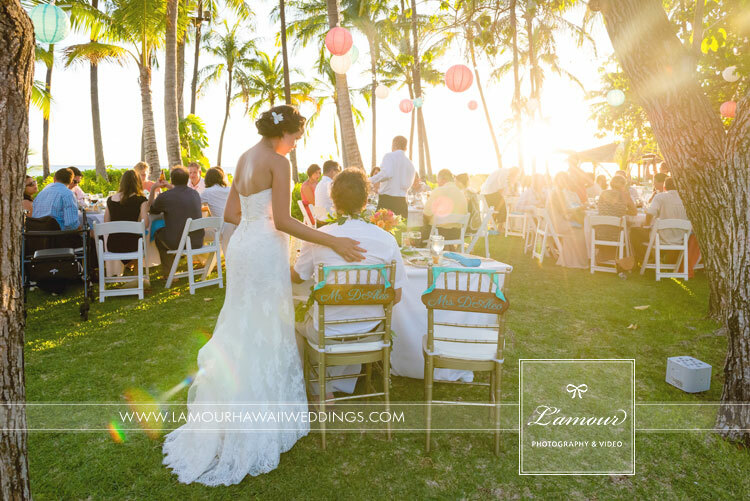 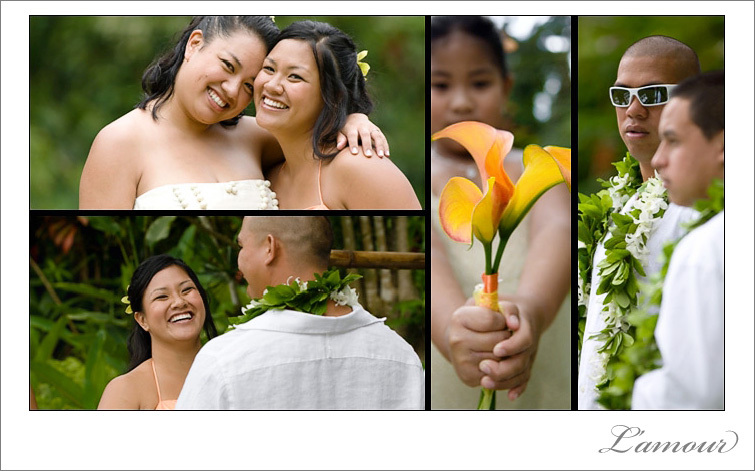 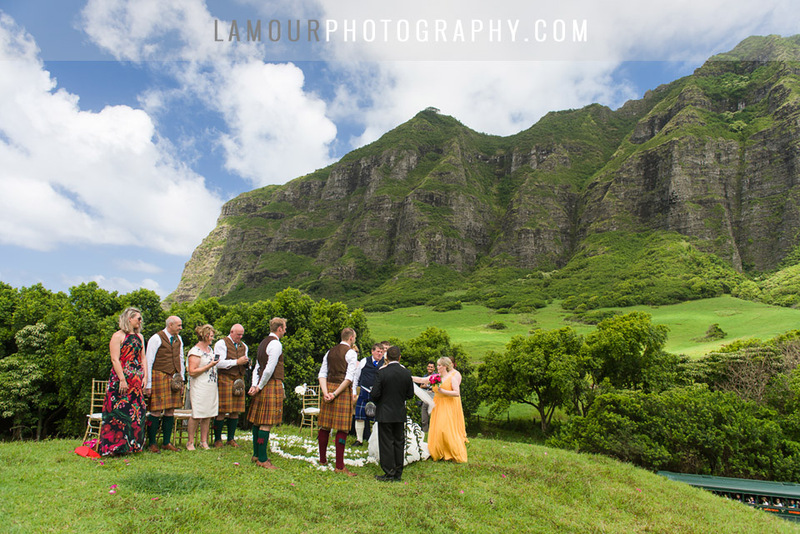 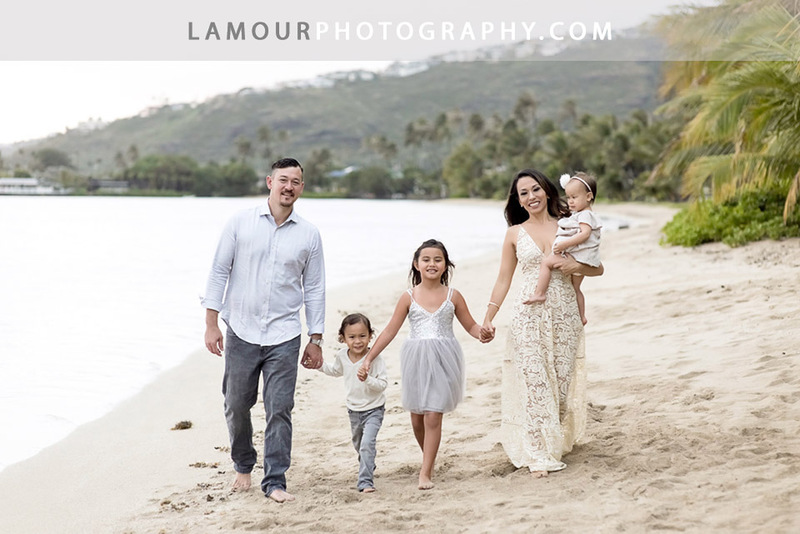 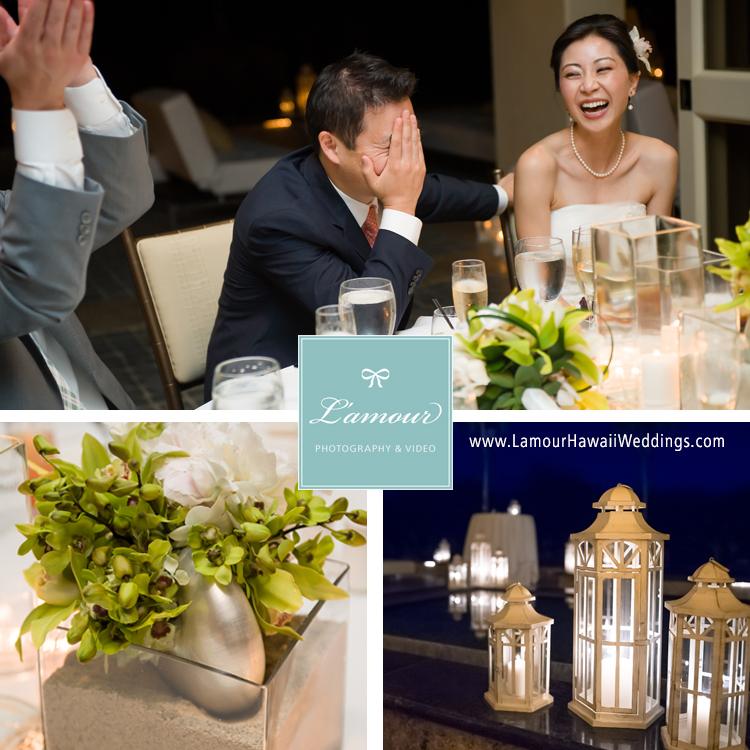 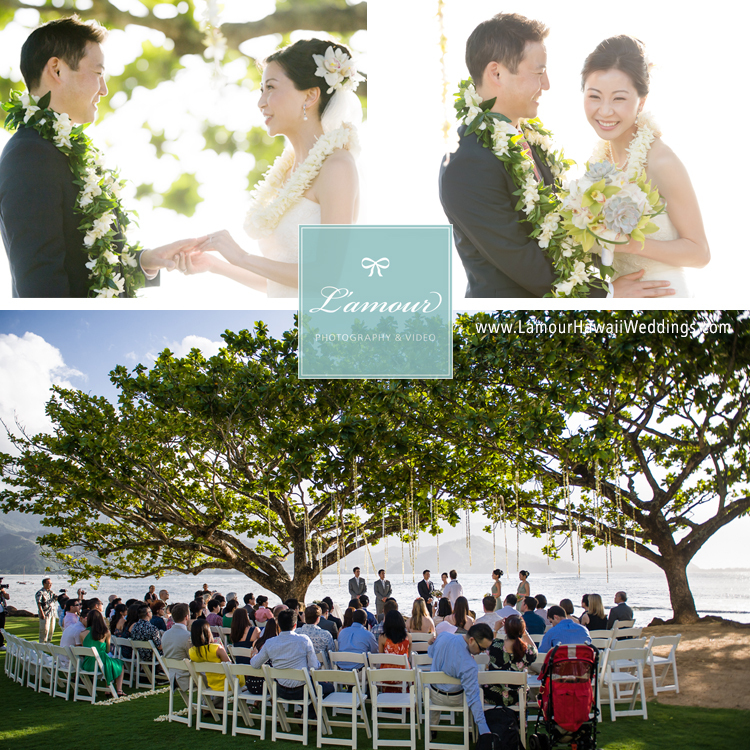 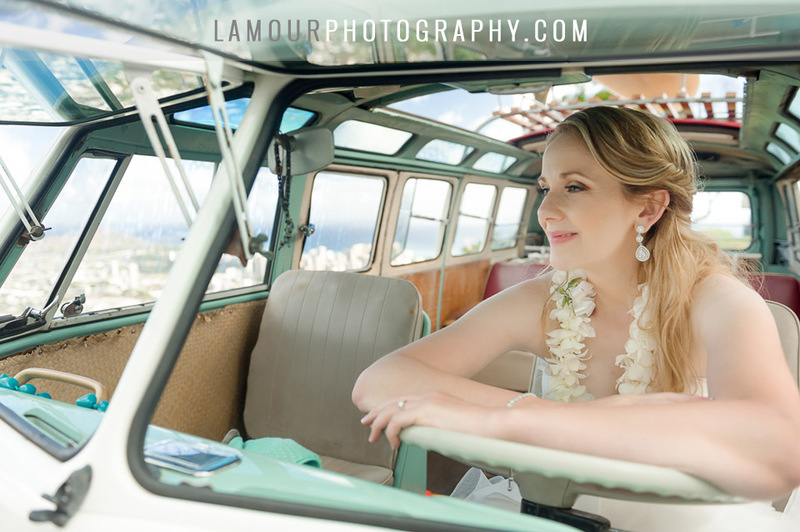 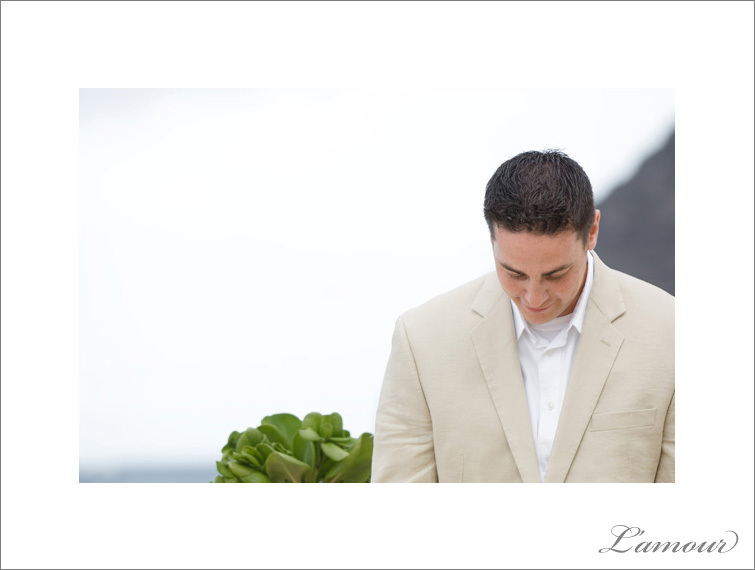 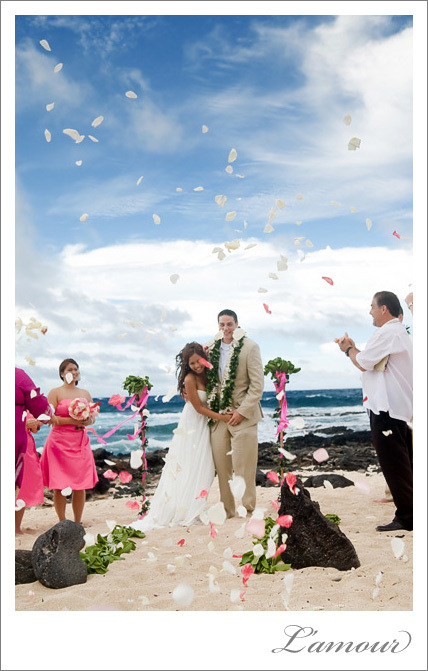 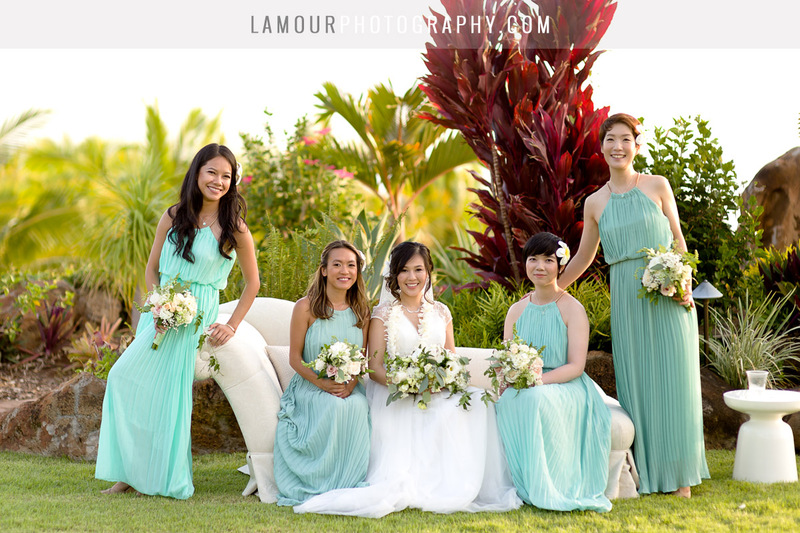 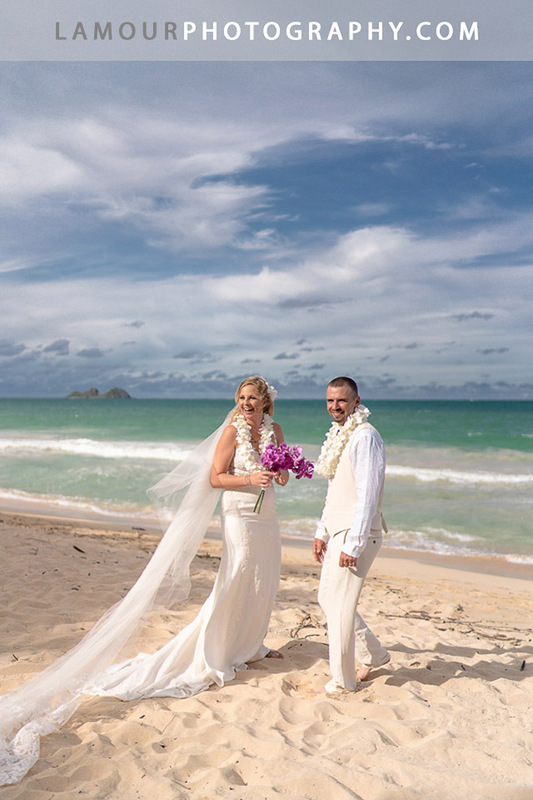 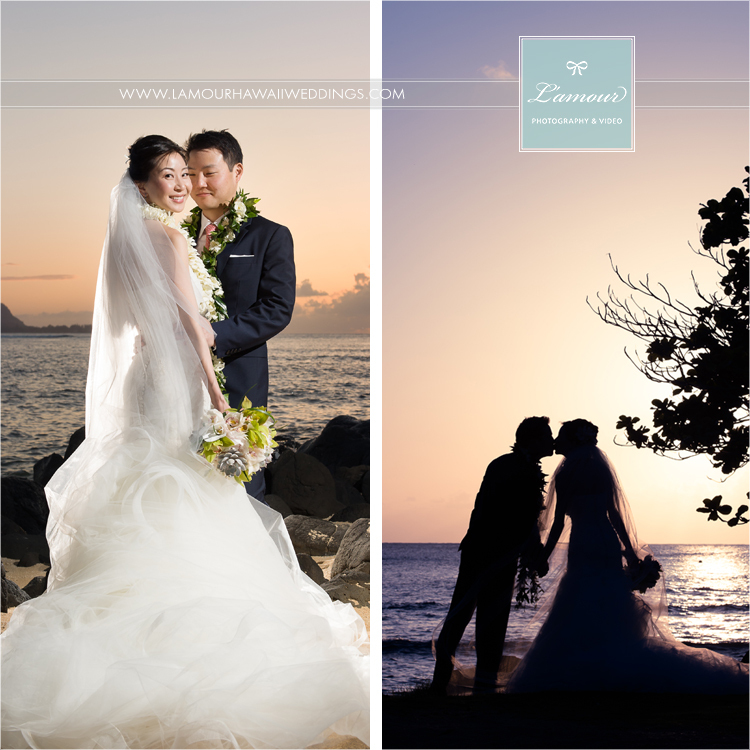 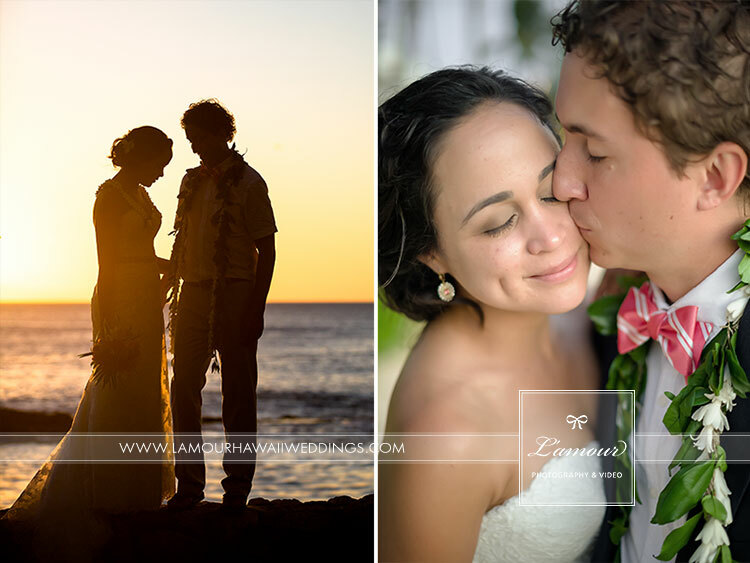 This cute couple were married in a sunset garden ceremony on the Winward side of Oahu. 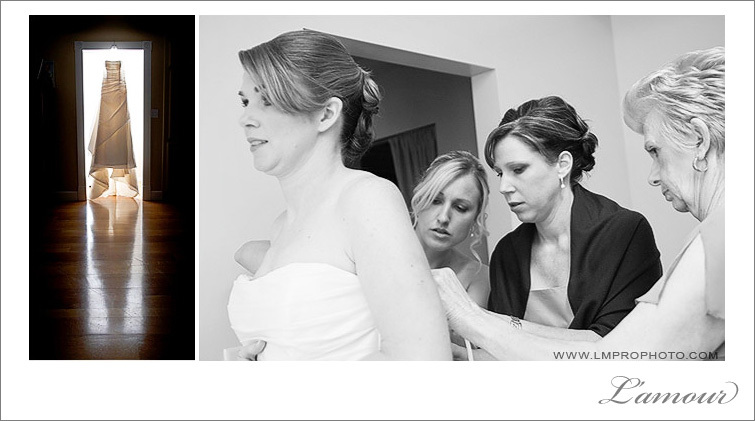 Amanda wore an elegant ivory sheath dress with pleated details and beading in the front and covered buttons in the back. 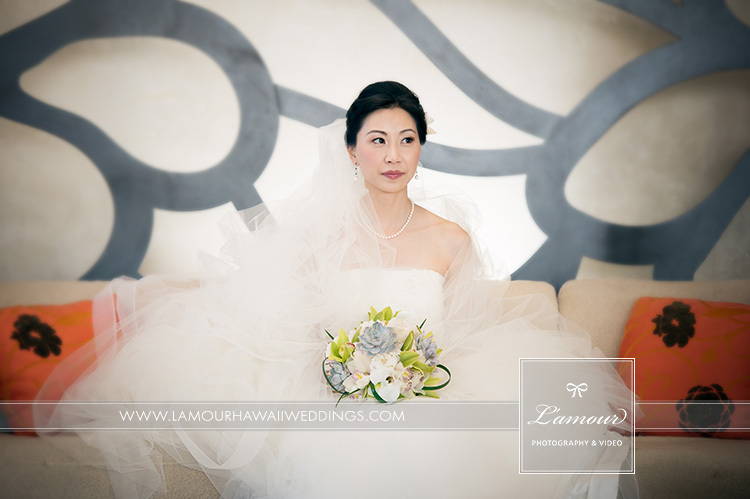 Her bouquet was a mixture of roses and orchids with blue accents. 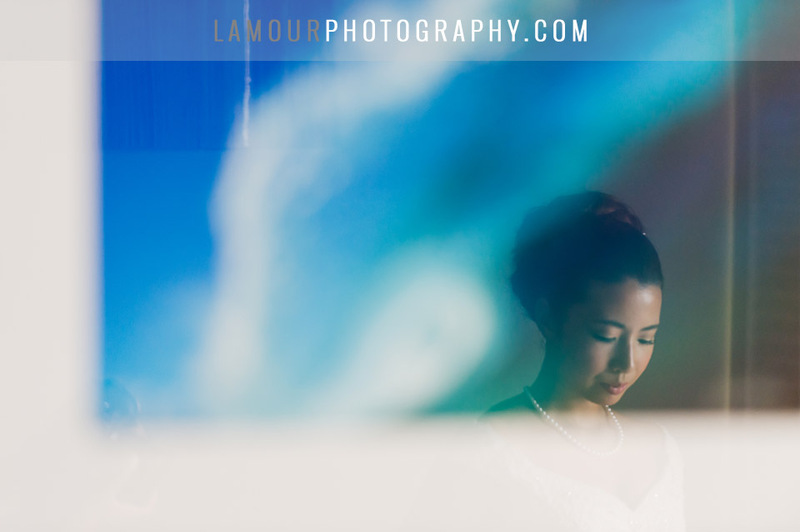 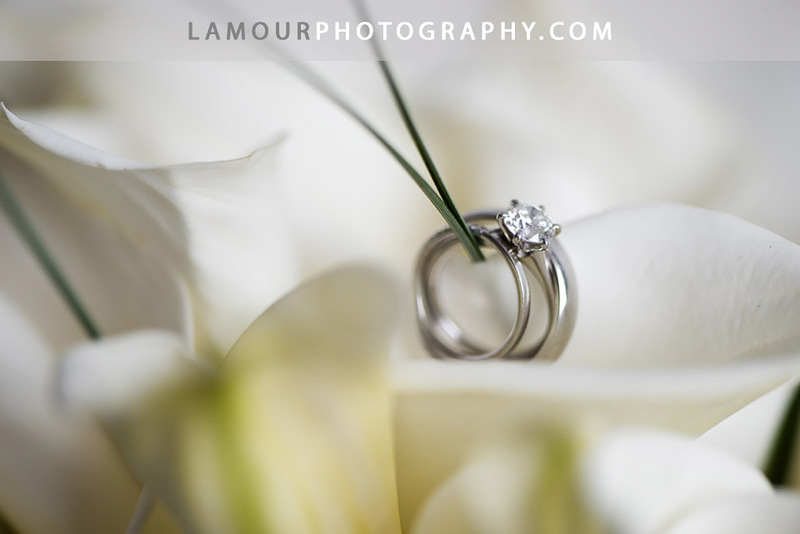 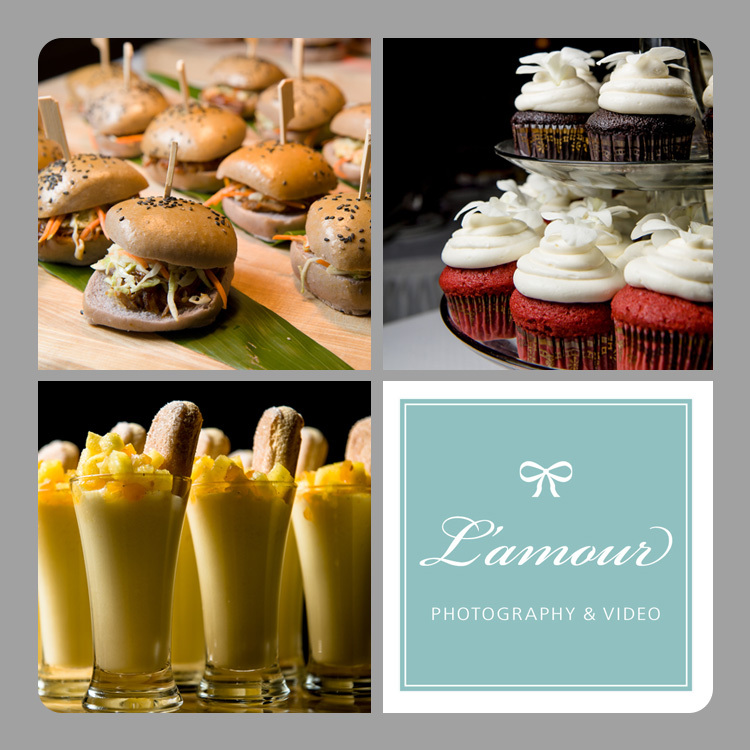 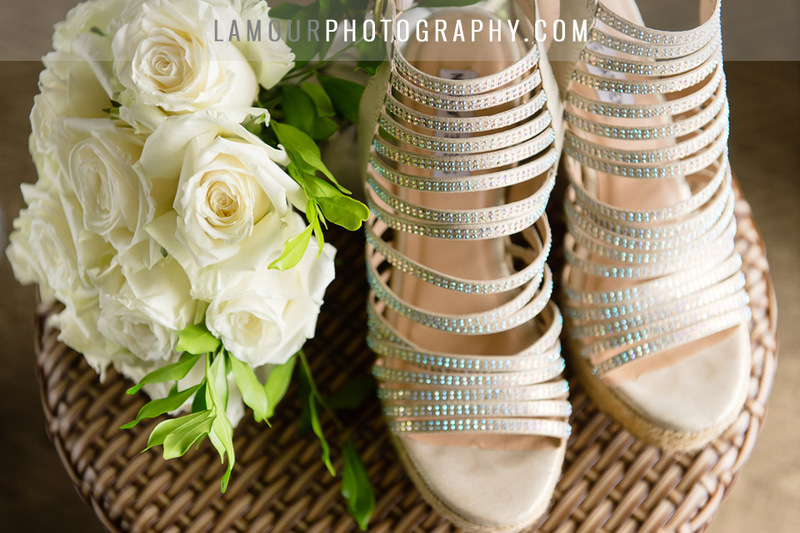 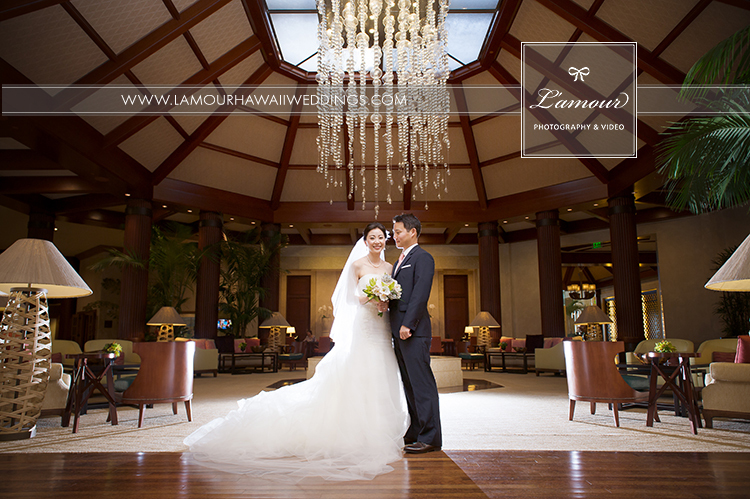 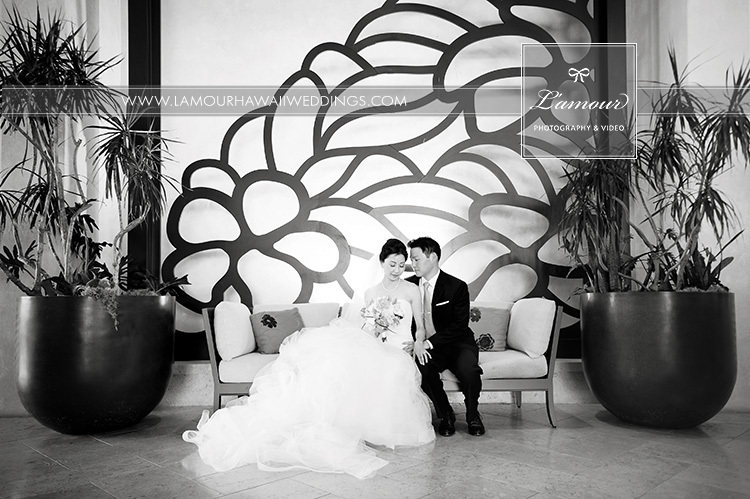 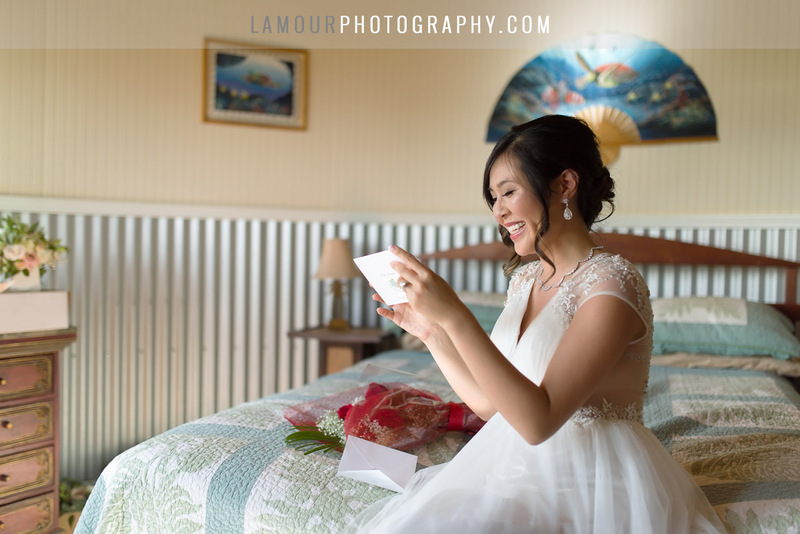 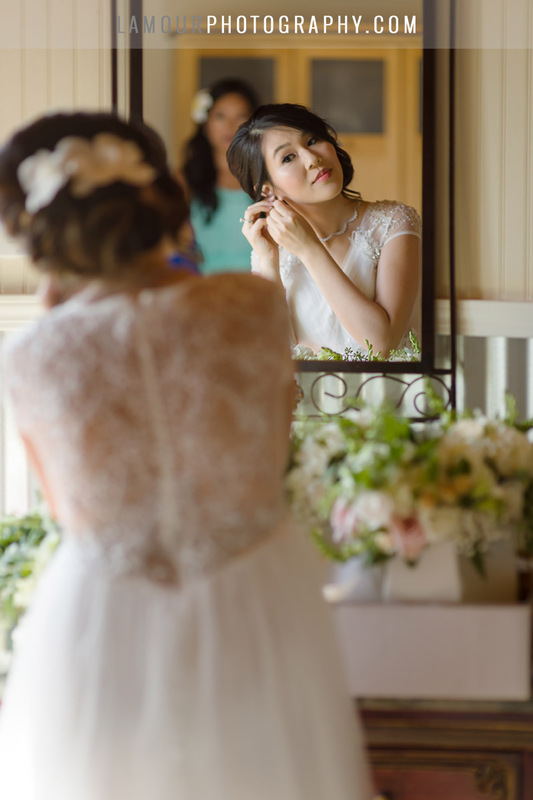 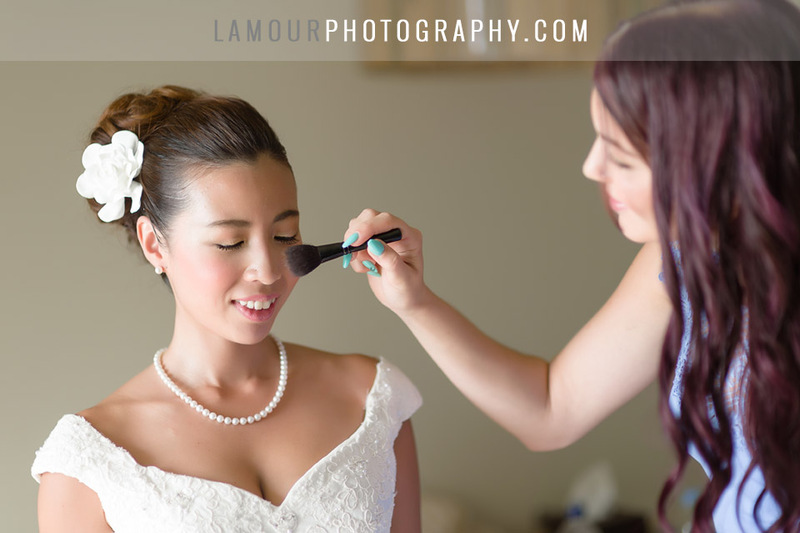 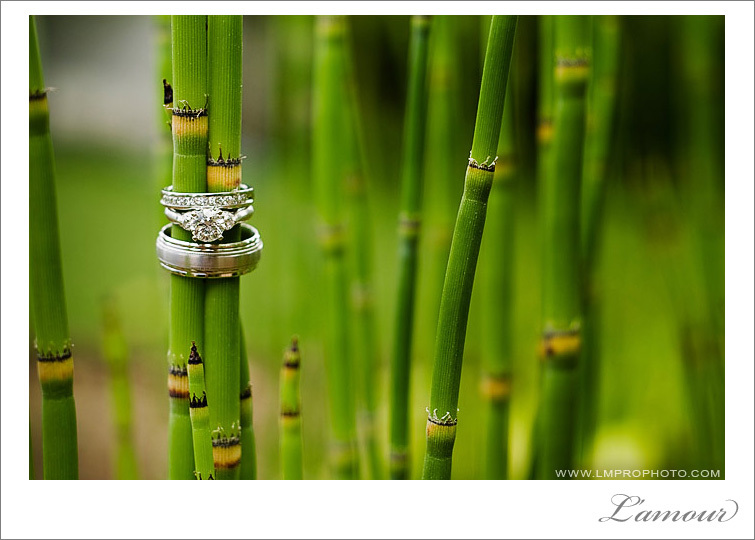 Best wishes to Amanda and Jeff from Wendy and Eric of L’Amour Photography!